Redbeds glow in the evening sun at Alcova Reservoir. 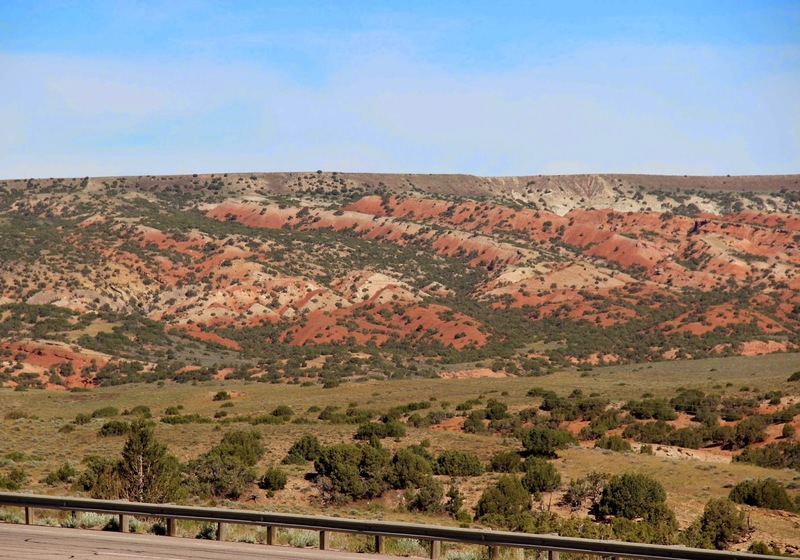 Geologists are of two minds about Wyoming redbeds. 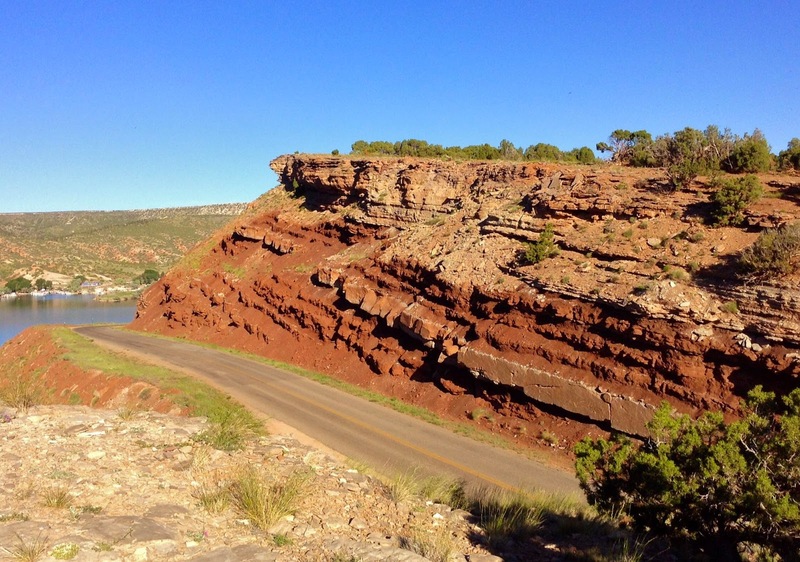 Many consider them “perhaps the most striking sedimentary strata in the state” (e.g. Snoke 1993, Picard 1993), but they largely ignore them when it comes to research. Redbed rocks are spectacular, but they contain few fossils and no oil. In contrast, the rest of us are single-minded in our attraction to redbeds. Countless photos have been taken of their eponymous landforms. The broad Red Valley surrounds the high Black Hills (distant right skyline). 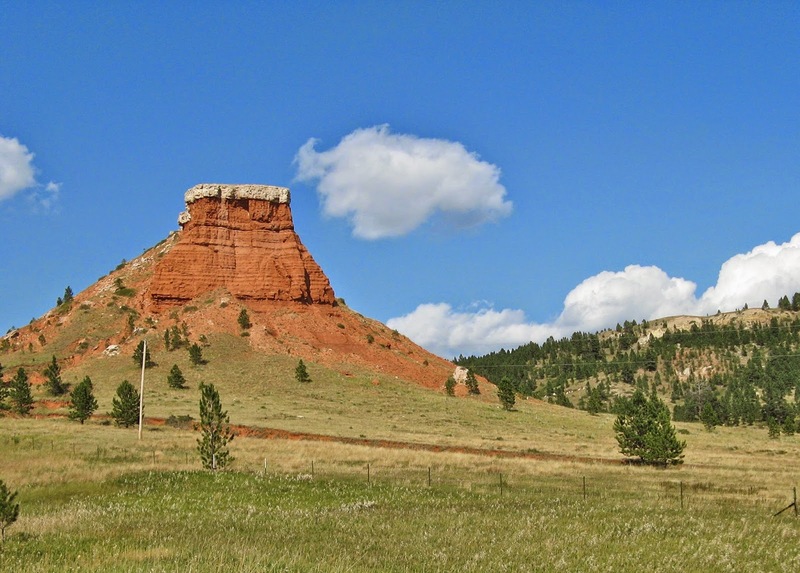 This Red Butte, one of many, is in the Red Valley south of Sundance, Wyoming. 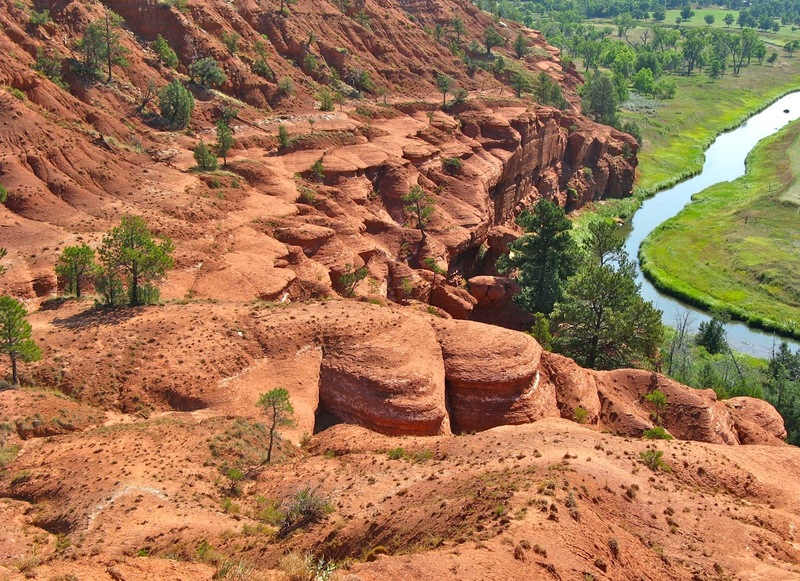 A hard cap of gypsum protects the soft red rocks from erosion. The Redwall of the southern Bighorn Mountains, the old stomping grounds of legendary bandits like the Sundance Kid. Photo courtesy Casper BLM. This Red Canyon -- south of Lander, Wyoming -- may be the most spectacular. Who can drive by without stopping and taking a photo?! From Wyoming Natural Diversity Database files. 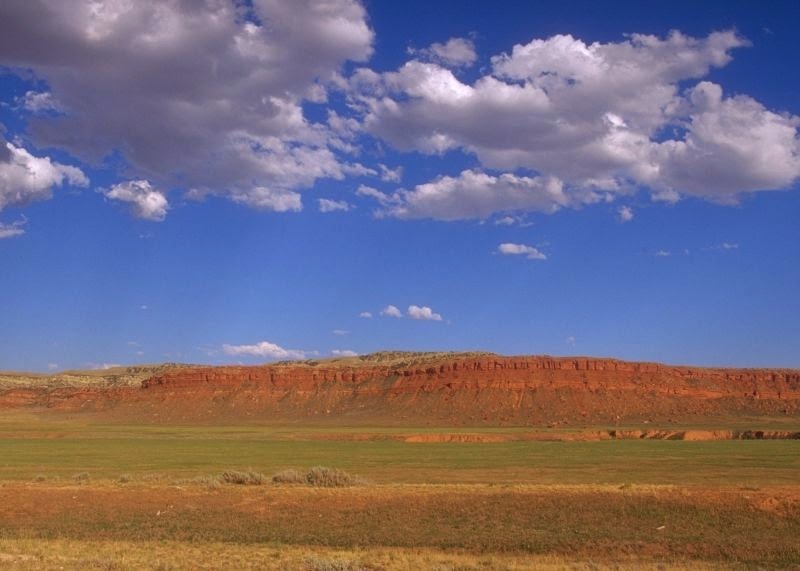 Redbeds in Wyoming date from the late Permian and Triassic periods, roughly 250 to 200 million years ago. The continents had again gathered to form a single supercontinent (Pangaea), as they had done a billion years earlier (Rodinia). [If you’re unfamiliar with how continents shift, grow, join, split and bump up against each other, see this friendly site about plate tectonics from the US Geological Survey.] 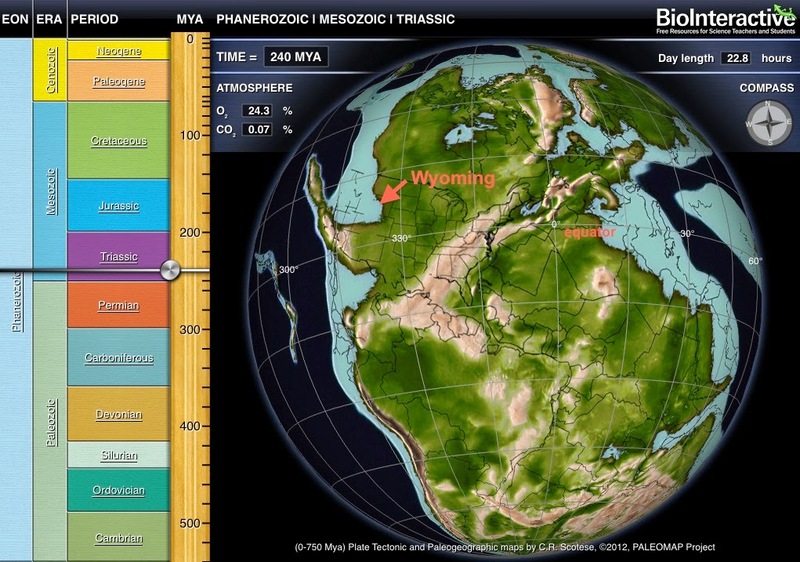 Today’s Wyoming was on the west coast of Pangaea, not far from the equator. The western part of the state was underwater; the rest was a low muddy coastal plain with extensive tidal flats (Picard 1993). 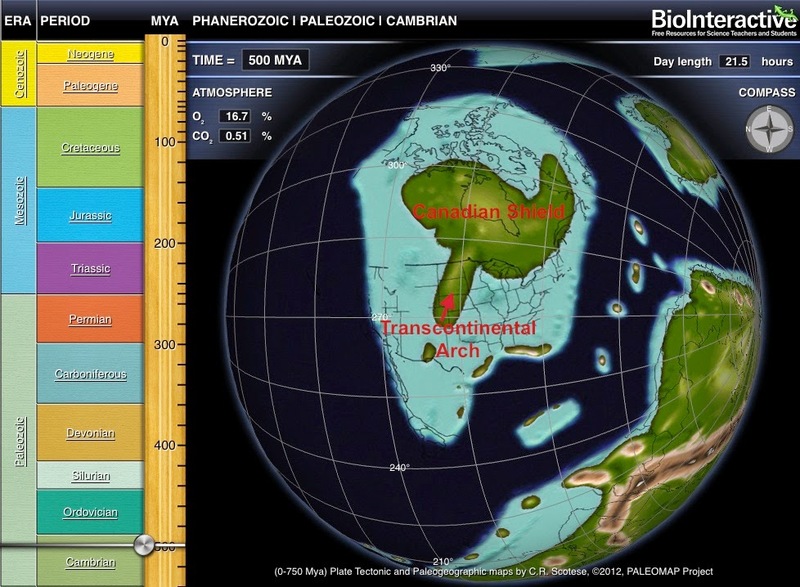 Paleo-reconstruction of Pangaea during early Triassic time, with modern-day Wyoming added. From the EarthViewer App, free from the Howard Hughes Medical Institute. 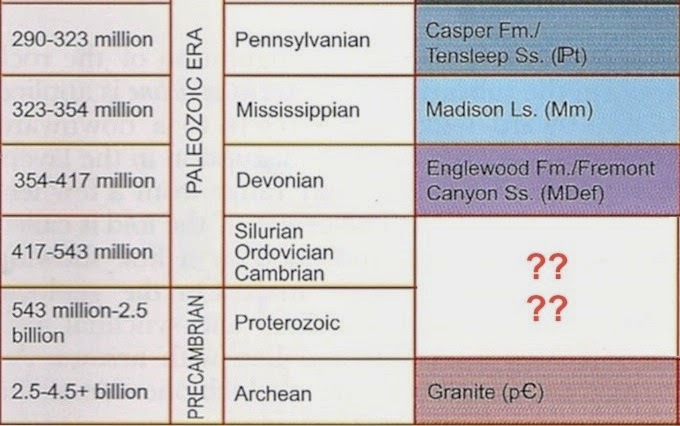 Permian to Middle Jurassic stratigraphy in Wyoming; modified from Cavaroc & Flores 1991. Rock units referred to in this post are underlined in red. 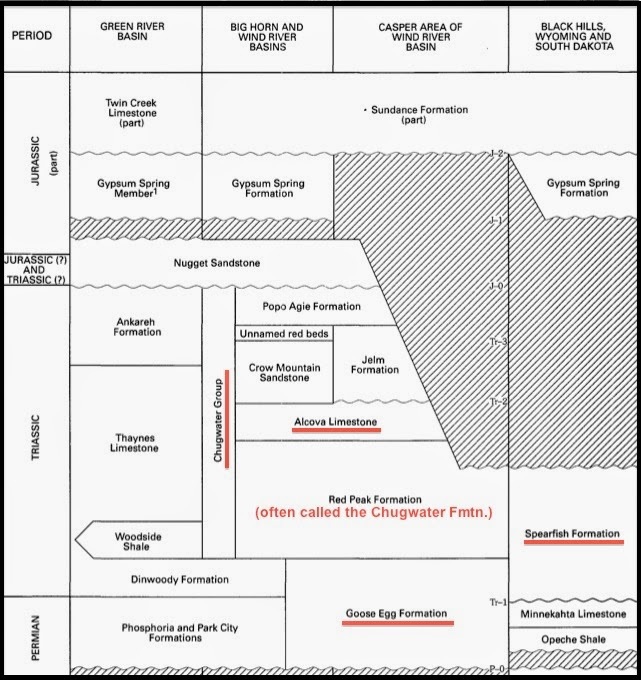 The “Chugwater Formation” in popular use is equivalent to the Red Peak Formation of the Chugwater Group. 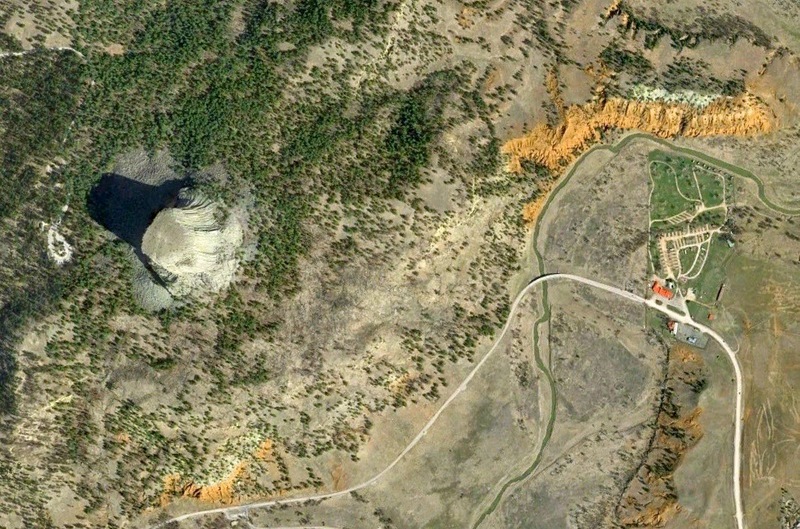 Several redbed formations are exposed in Wyoming. The oldest is the Permo-Triassic Goose Egg Formation. 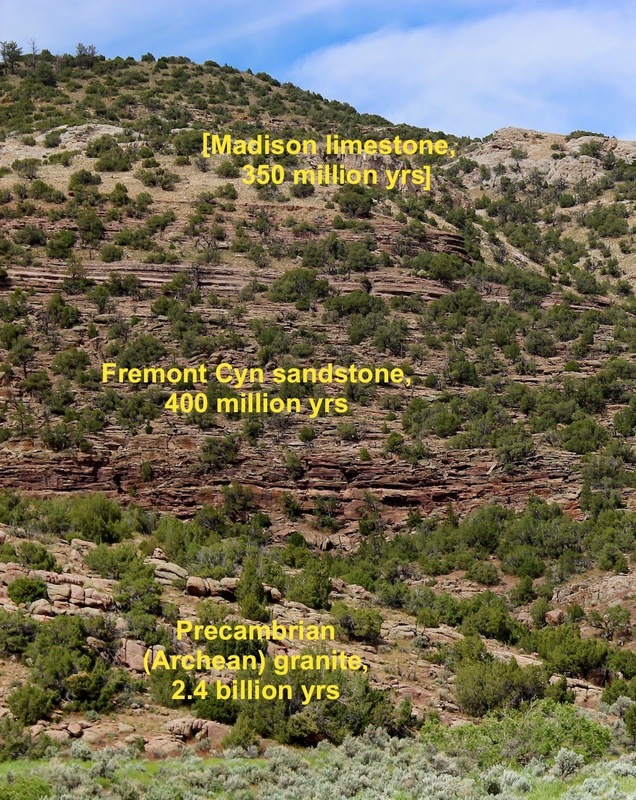 The next in age and best-known is the Triassic Chugwater Group. 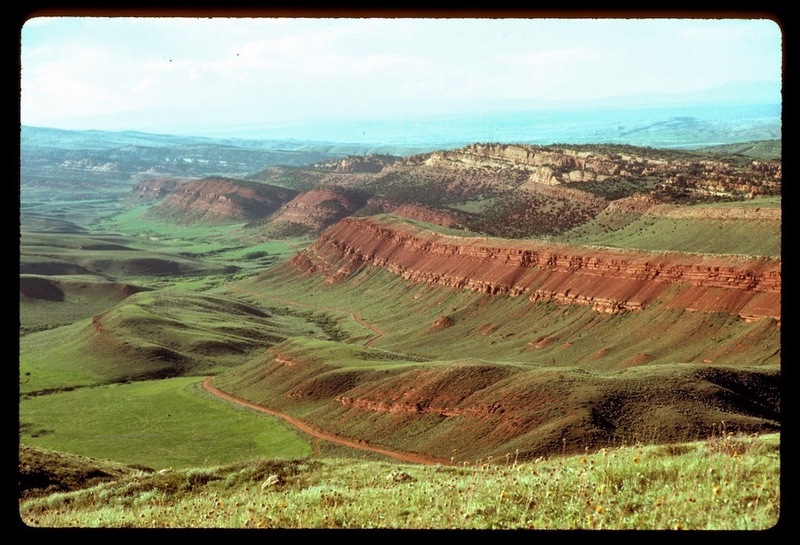 The Chugwater Formation was described in 1904 by Nelson Horatio Darton, one of the great field geologists of the day. In 1967, the Chugwater was elevated to group status by High and Picard, who recognized three formations within (Picard 1993). However, following others (e.g. Knittel et al. 2004), I will continue to use “Chugwater Formation” or simply “the Chugwater”. 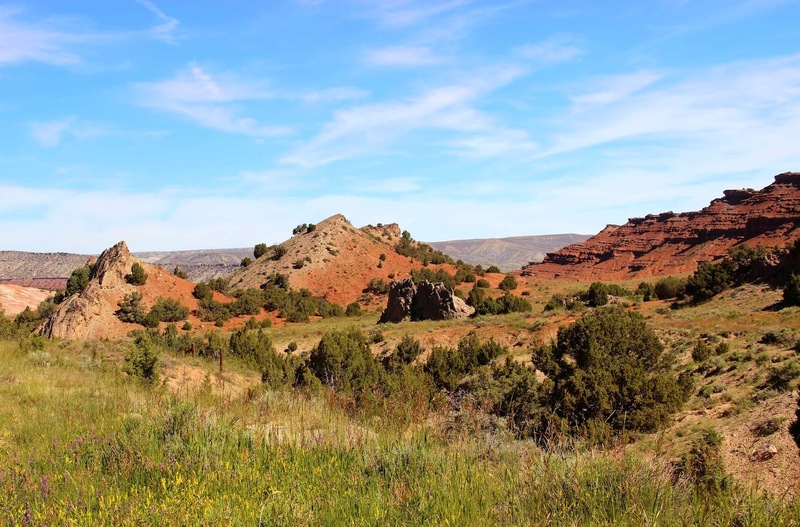 Redbeds also occur in northeast Wyoming, made of the Permo-Triassic Spearfish Formation. The Spearfish is equivalent to both the Goose Egg and the lower Chugwater (no surprise here -- nature is never simple). Redbeds of the Spearfish Formation, exposed by the Belle Fourche River below Devils Tower. 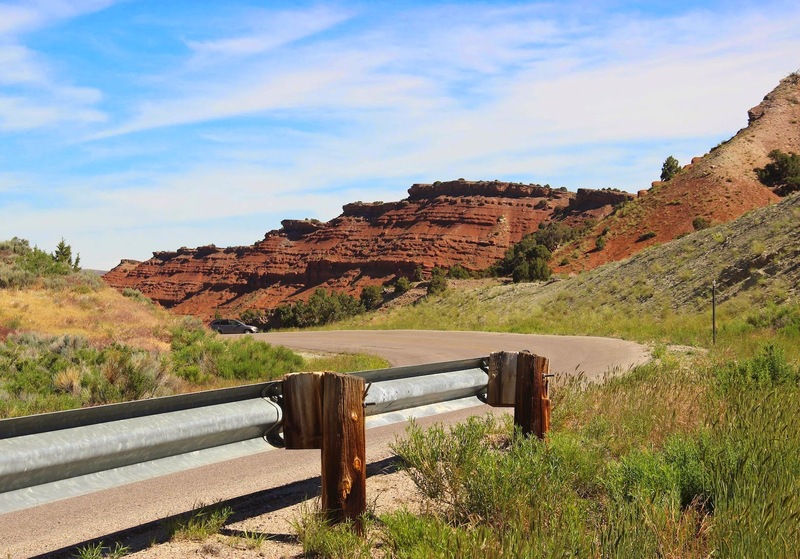 Chugwater redbeds are frequently capped by a thin resistant layer of Alcova limestone, a shallow marine limestone. For a short time, the seas advanced eastward, submerging the Wyoming coastal plain and depositing limey sediments on it. The Alcova is as extensive as the Chugwater and almost as easy to recognize. It’s “one of the most widespread marker beds in North America, covering at least 50,000 square miles” (Picard 1993). The distinctive Chugwater capped by the equally-distinctive Alcova limestone, also in foreground. Fast-forward now to the Jurassic and Cretaceous periods, roughly 200 million to 75 million years ago. 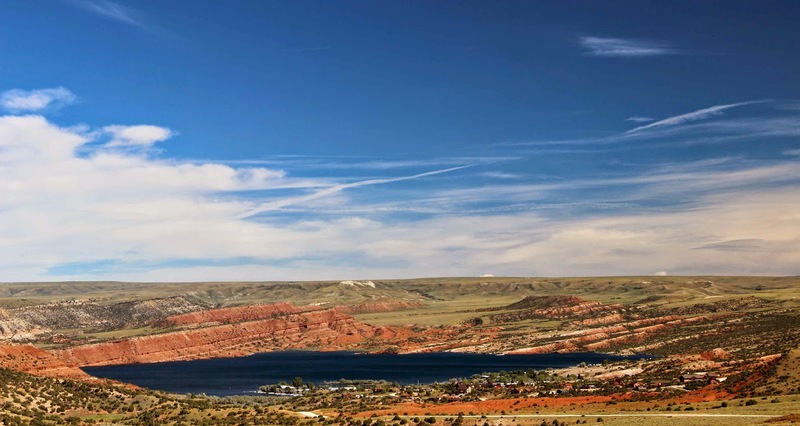 During this time, Wyoming was periodically covered by an inland sea and thousands of feet of sediments were deposited. The Goose Egg, Chugwater and Alcova were buried under younger strata. With the overlying pressure, they were lithified -- turned to rock. And there they lay, hidden from view, unappreciated. A rather dull trip across south central Wyoming 75 million years ago; strata forming modern-day redbeds labeled in red. Cross-sections modified from Knittel et al. 2004. Then, fortunately, the Laramide Orogeny created the Rocky Mountains. Crust was uplifted, folded and fractured, and erosion uncovered the old rocks. Now the remains of Triassic tidal flats are nicely exposed as picturesque redbeds. Traveling across south central Wyoming in 2014; locations of redbeds indicated with bold arrows. 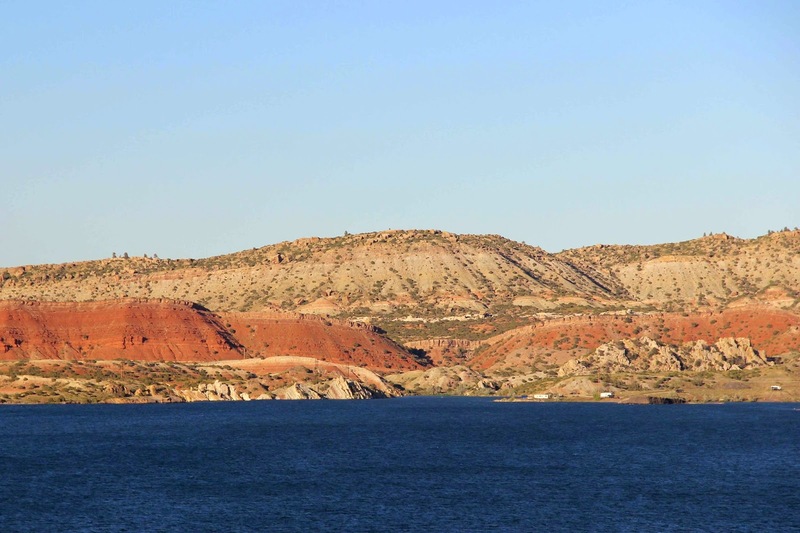 On my recent trip through the Heartland of Laramide Tectonics, redbeds dominated the landscape around Alcova Reservoir. The scenery they create is striking -- almost surreal at times. As a bonus for geo-geeks, geologic structures dating to the Laramide Orogeny are visible too. 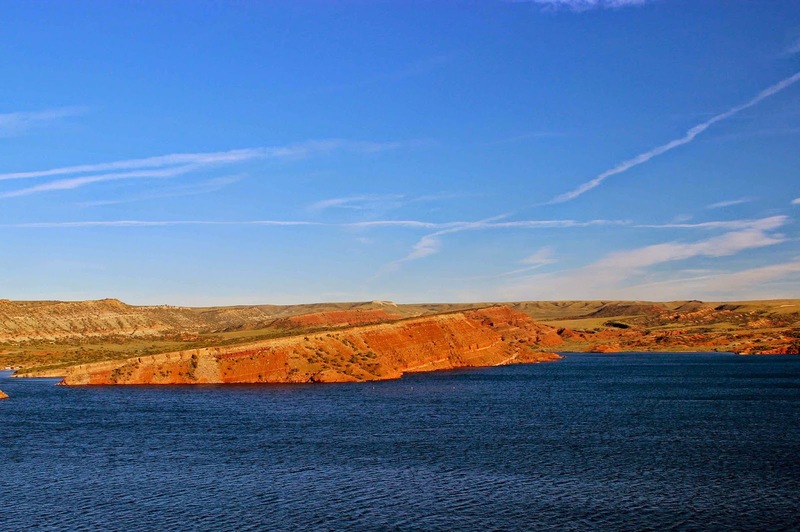 Alcova Reservoir sits among redbeds tilted during the Laramide Orogeny. The Alcova anticline (uplift) is the ridge on the nearer skyline. Note redbeds, and gap cut by North Platte River. 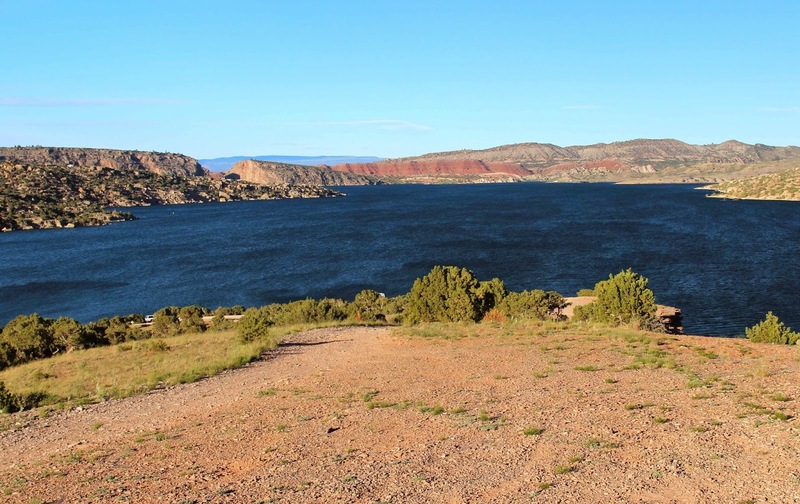 The photo above was taken from a dip slope on Alcova limestone, looking northeast across Alcova Reservoir. The Chugwater is not far below my feet, under the limestone, yet it stands noticeably higher at the other end of the lake. That’s because there’s an uplift, a fault and a basin in-between. Cross-section in area of Alcova Reservoir; dashed line is reservoir surface. Laramide structures are indicated with red arrows. Modified from Knittel et al. 2004. Below is a view northeast toward Black Beach from Okie Campground. Nearly-vertical sandstone outcrops (right, below redbeds) are on the steep southwest flank of the Alcova anticline. The redbeds and other rocks behind make up the gently-dipping (away from viewer) northeast flank. Here’s a closer look at the Black Beach area. A classic Laramide high-angle reverse fault runs behind the nearly-vertical sandstone outcrops on the right, bringing Triassic redbeds face-to-face with younger sandstones and conglomerates. This is the Alcova fault shown in the cross-section above. The next photo was taken in the core of the Alcova anticline, with steeply-tilted limestone-capped redbeds on the left, and gently-dipping strata of the northeast flank on the right. These are the lithified remains of old tidal flats, back when Wyoming was coastal property near the equator. How cool to be able to go back in time 200 million years! Another view of the gently-dipping (away from viewer) northeast side of the Alcova anticline. Several redbed formations are exposed in the Alcova area. The photo below shows the older Permo-Triassic Goose Egg Formation on the left. It contains more gypsum than the Chugwater, and tends to be variegated. The younger Chugwater forms the hogback to the right; note the typical thin limestone cap. The dipping Goose Egg and Chugwater are overlain by younger horizontal strata, which must have been deposited after the Laramide Orogeny because they’re not folded. When horizontal rocks lie atop tilted ones, we have an angular unconformity. Field geologists are especially fond of them, maybe because they’re relatively easy to see. The variegated Permo-Triassic Goose Egg Formation. Why are redbeds red? That’s a really common question. As a seasonal ranger at Devils Tower National Monument, I would answer that the redbeds are made of iron-rich sediments that rusted (oxidized) because they were deposited in shallow water (I don’t remember where I learned this). Picard (1993) concluded that Wyoming redbeds turned red during diagensis -- while they were being converted to rock. The question is not settled, however, and they may well have rusted in place on the old tidal flats, as we used to tell the visitors. For more discussion, see this summary of redbed types and their genesis. Redbeds near Devils Tower. Google Earth doesn't do them justice color-wise. 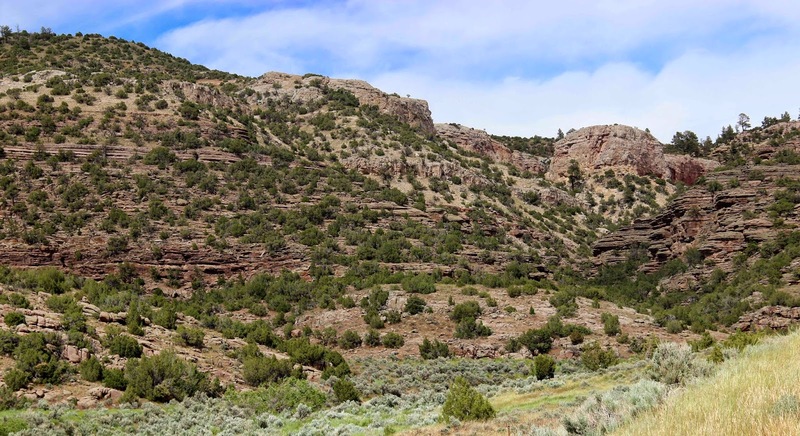 This is the third in a series of posts about the “Heartland of Laramide Tectonics” in south central Wyoming. 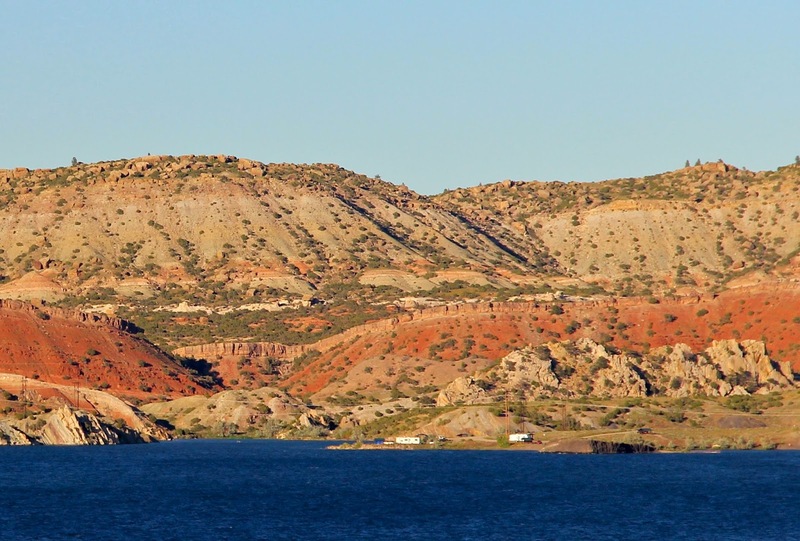 Others feature an overview of the Folded Land and a look at the Great Unconformity. More highlights will follow. Cavaroc, VV and Flores, RM. 1991. Red beds of the Triassic Chugwater Group, southwestern Powder River Basin, Wyoming: US Geological Survey Bulletin 1917:E1-E17. Knittel, P, Van Burgh, Jr., DP, Logue, TJ, Strube, BE, and Jones, RW. 2004. Field guide for the Alcova area, Natrona County, Wyoming. Picard, MD. 1993. The early Mesozoic history of Wyomng, in Snoke, AW, Steidtmann, JR, and Roberts, SM, eds. Geology of Wyoming. Wyoming State Geological Survey Memoir 5:210-248. 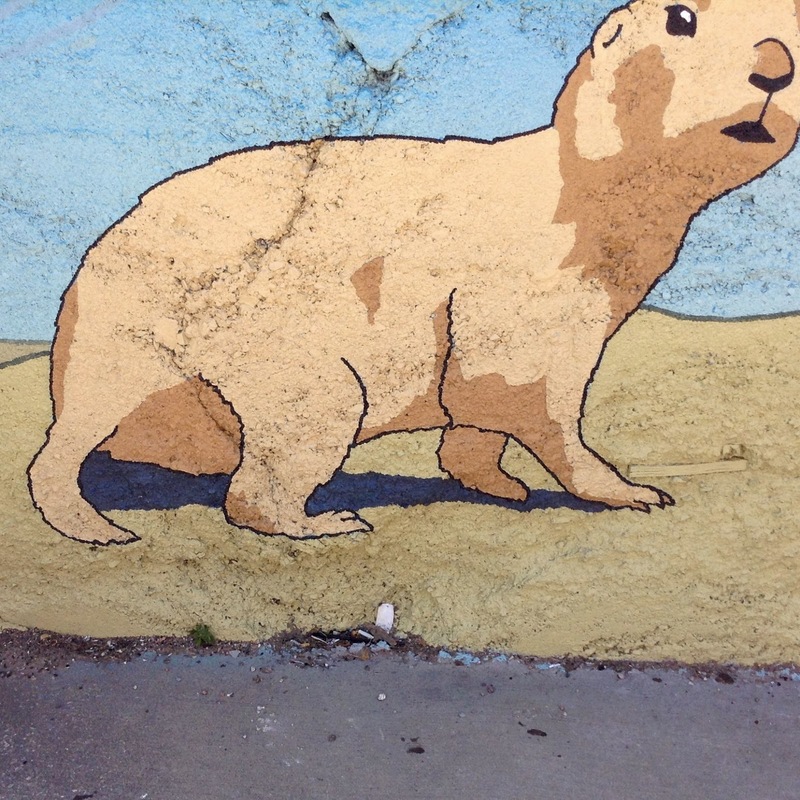 There’s a scrappy little Virginia creeper growing from the crevice below the right rear heel of the giant prairie dog (click on image to view). 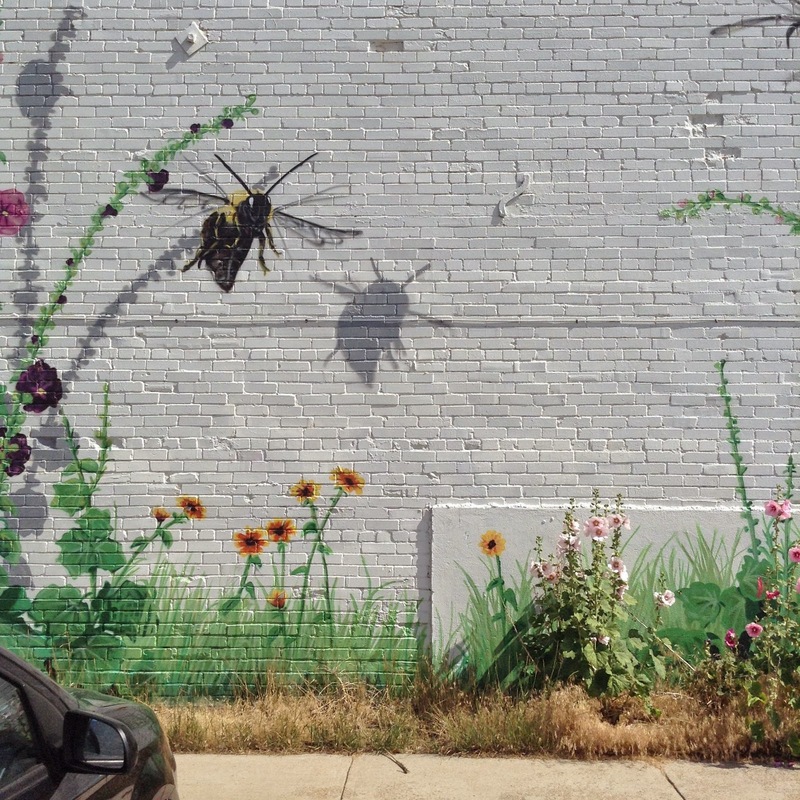 I stumbled into urban botany by way of Lucy Corrander’s Street Plant posts (my favorite is this one). 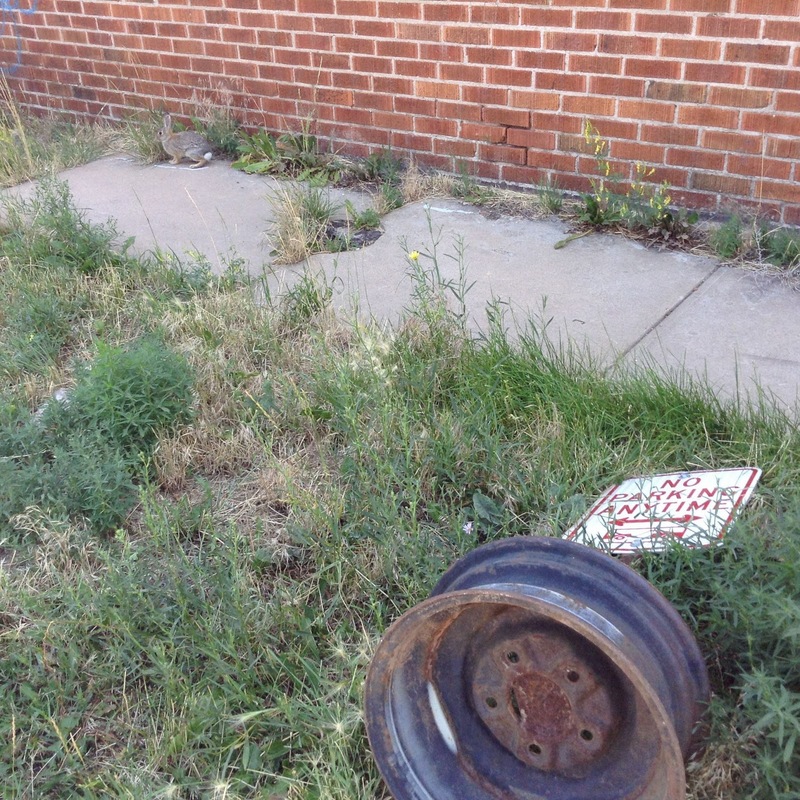 I’ve done a few too -- about dandelions and other plants taking back the streets -- so-called weeds. 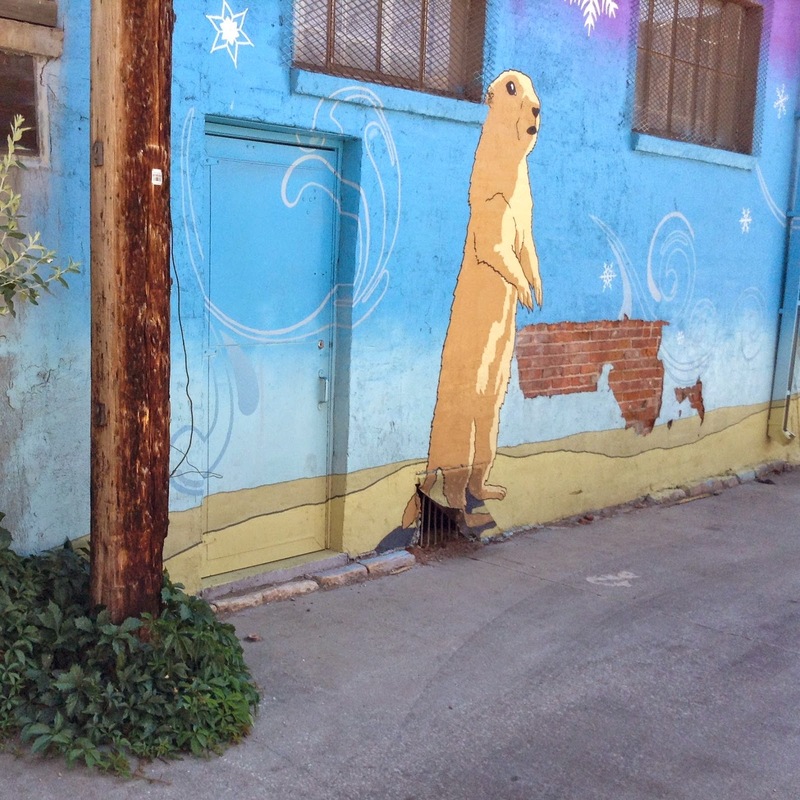 But I’ve mostly ignored our urban flora. 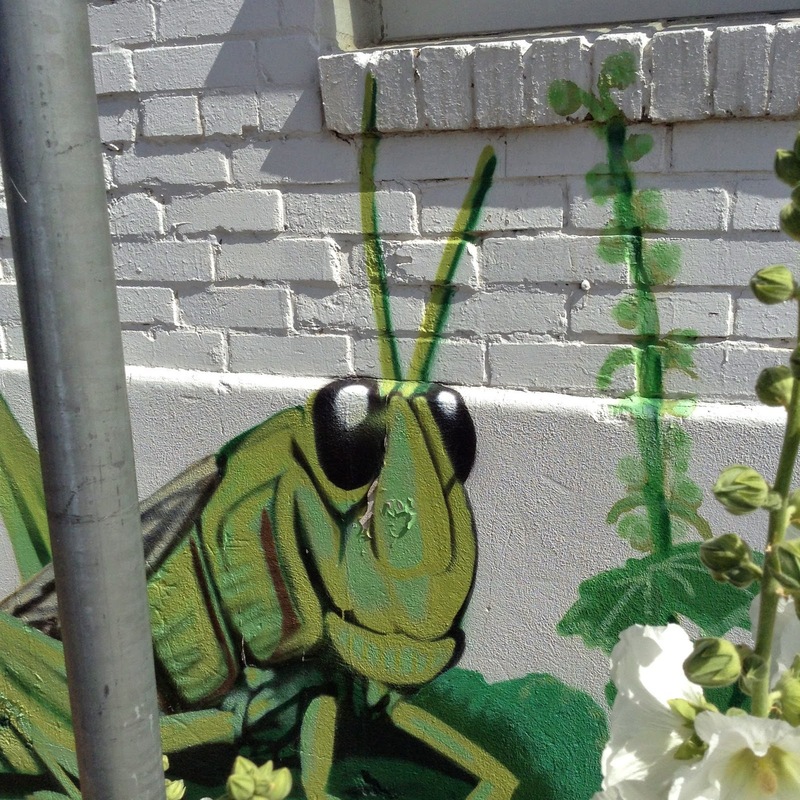 Yet every time I read about Lucy’s street plants, I think it would be neat to look at our own. So finally I did. 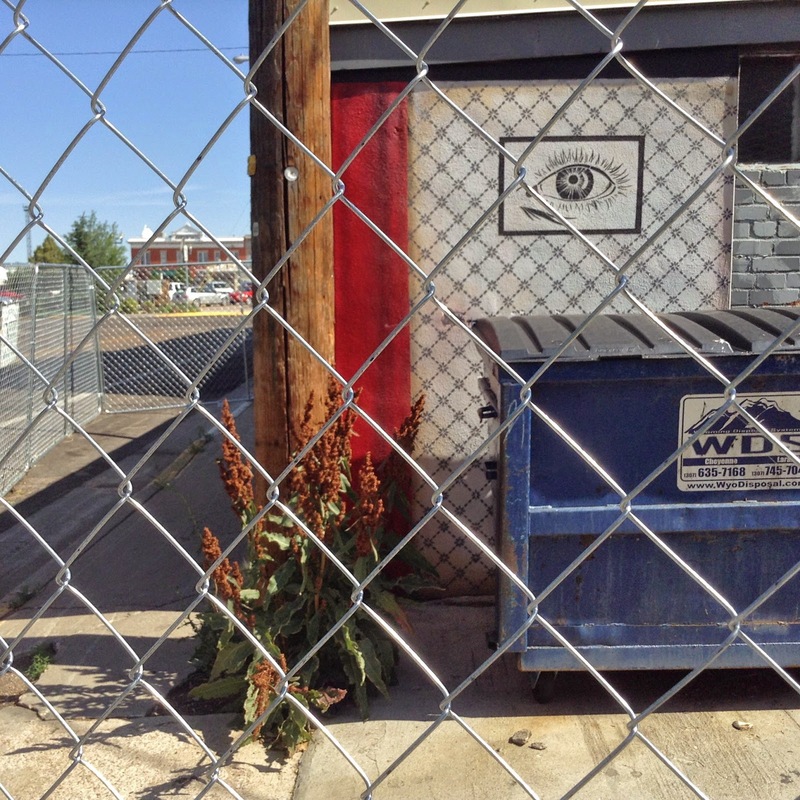 I often bike through downtown Laramie, but totally ignore the plants of cracks and crevices. So I wasn’t sure I would find many suitable subjects. I needn’t have worried. 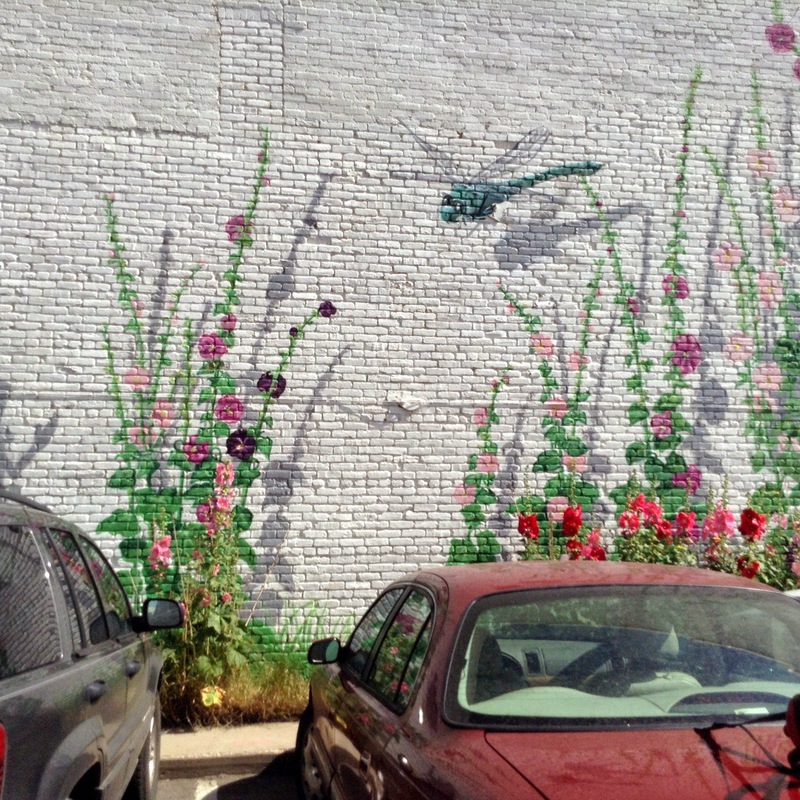 We have tough and tenacious plants, and our streets are not that well kept. In fact, I had to narrow my focus. I decided to limit myself to plants in artistic habitats. Virginia creeper, Parthenocissus vitacea, is well-established at the base of a telephone pole. 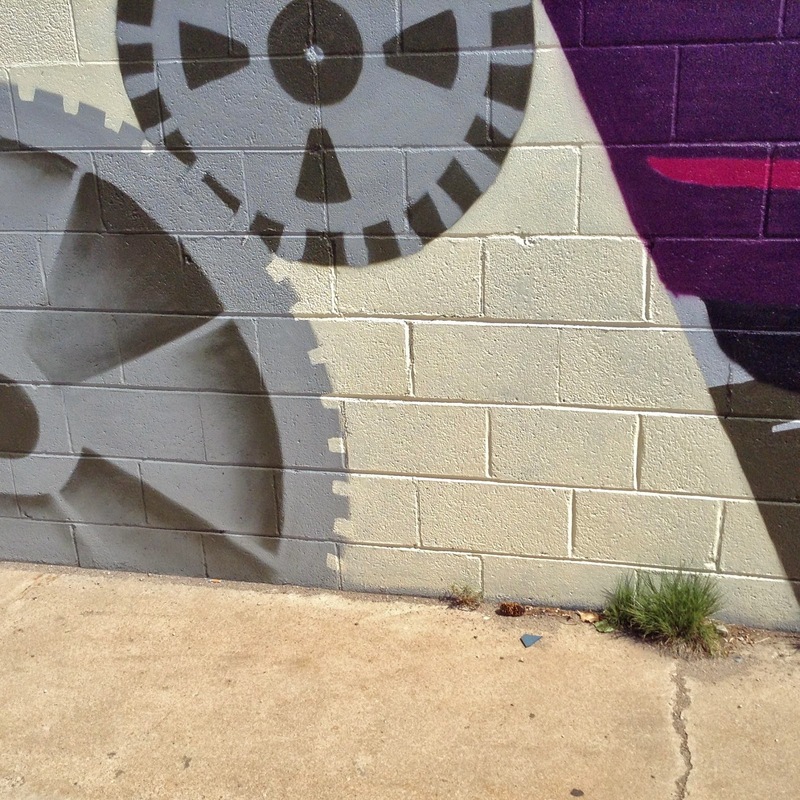 It sounded appealing -- liberating as well as playful -- so I instagrammed the urban plants. Actually, I used the square photo setting on my iPad mini, but the experience was the same. Limited to square photos, with no viewfinder and often bright sunlight, I wasn’t able to obsess over composition. Pretty soon I was “connected to playfulness”. 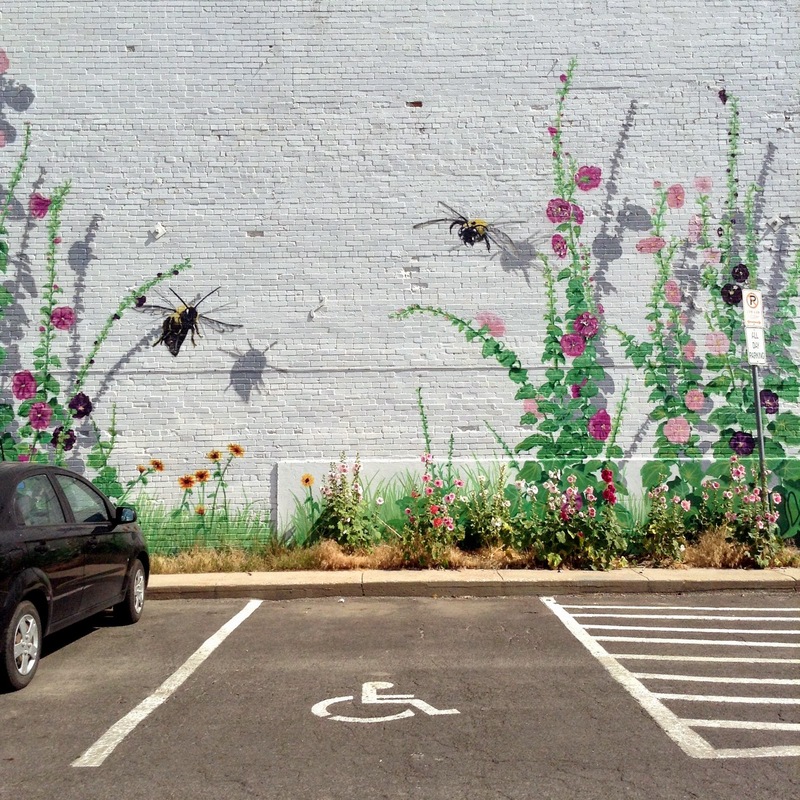 Lucy mentions the looks she gets when she’s on the pavement face-to-face with street plants. I had no such pleasure. If anyone looked at me odd, I didn’t see it. 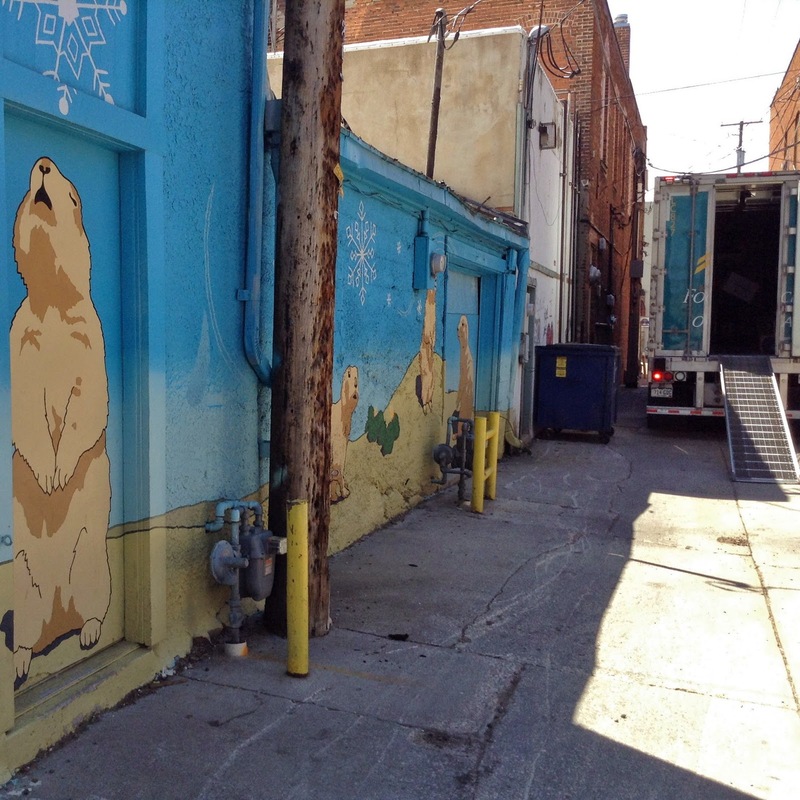 I did have to move once for a delivery truck; there wasn’t room in the alley for both of us. 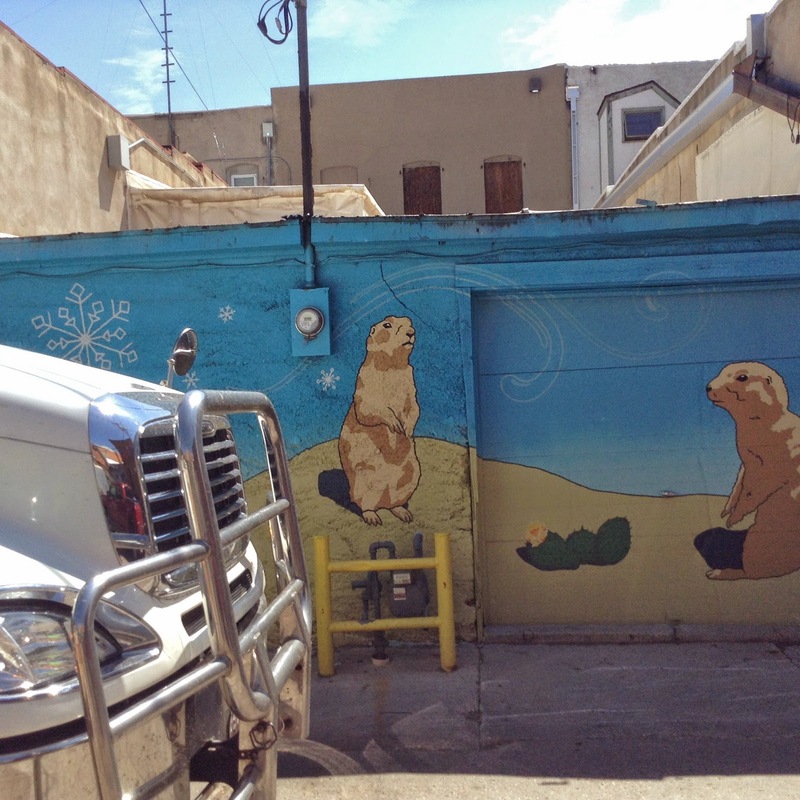 Prairie Dog Town, by Jeff Hubbell and Lindsay Olson. 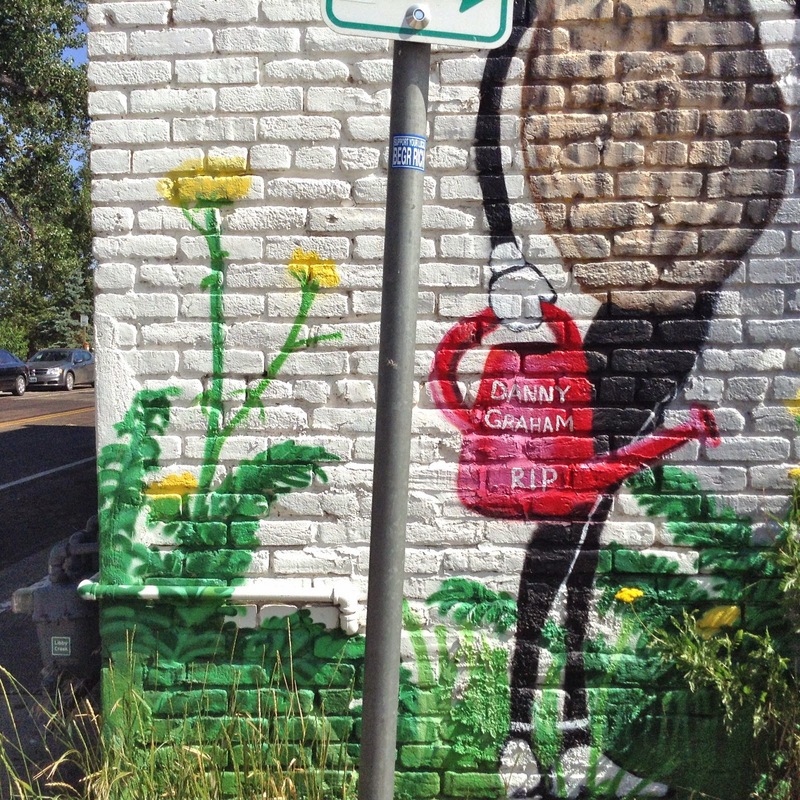 Among the most common street plants in Laramie is cheatgrass, Bromus tectorum. Cheatgrass habitat -- a crevice below the Snowy Range. Close by I found more cheatgrass, with dandelions and kochia (left to right). Occasionally I strayed from the Instagram format for habitat shots. From Escape by Meghan Meier. Kochia with a bit of dock. 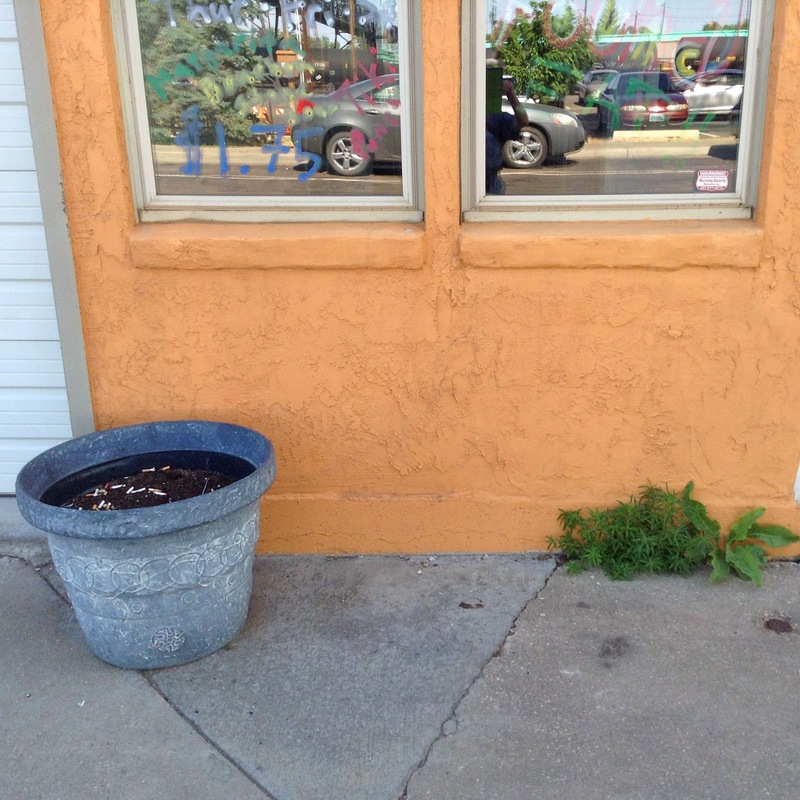 Kochia, or summer cypress, is really common in downtown Laramie ... and most other parts of town. It came to the USA from Eurasia and is one of our tumbleweed species. 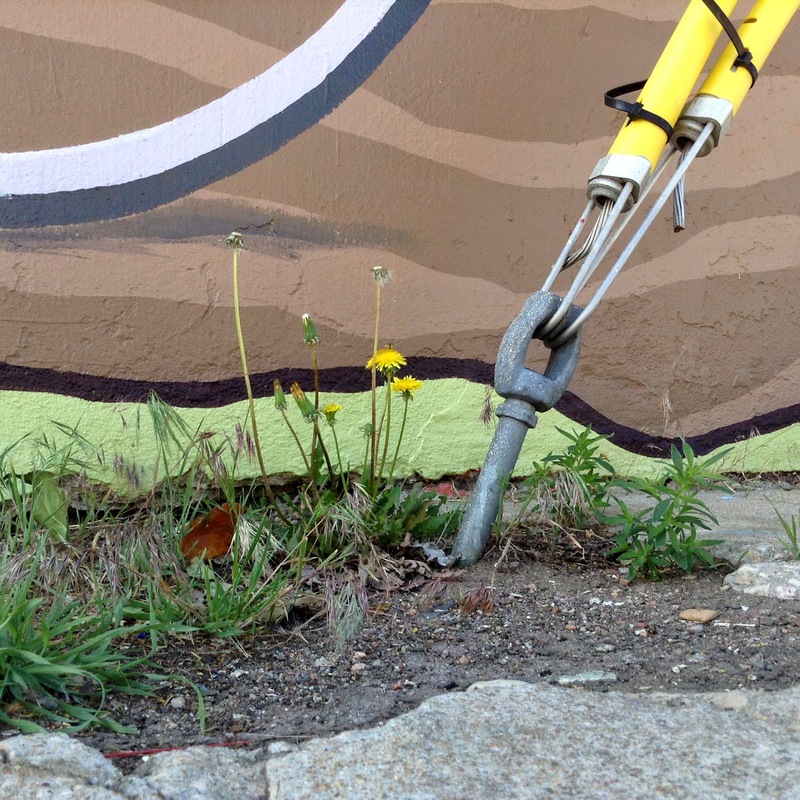 We city-dwellers think it’s a weed. But it’s very good browse for livestock and wildlife, and after I learned that the seeds are high in protein and great feed for birds, I didn’t feel so bad about all the kochia in my yard. The seeds also have medicinal potential (for humans). The NRCS has put together an excellent Plant Guide for kochia (PDF). Kochia is Kochia scoparia to some and Bassia scoparia to others. It’s a member of the amaranth family. Here’s a much more robust dock plant, Rumex crispus. Plants at the base of phone poles seem to do well. The fence is here because the optical shop burned several months ago and it’s still being repaired. 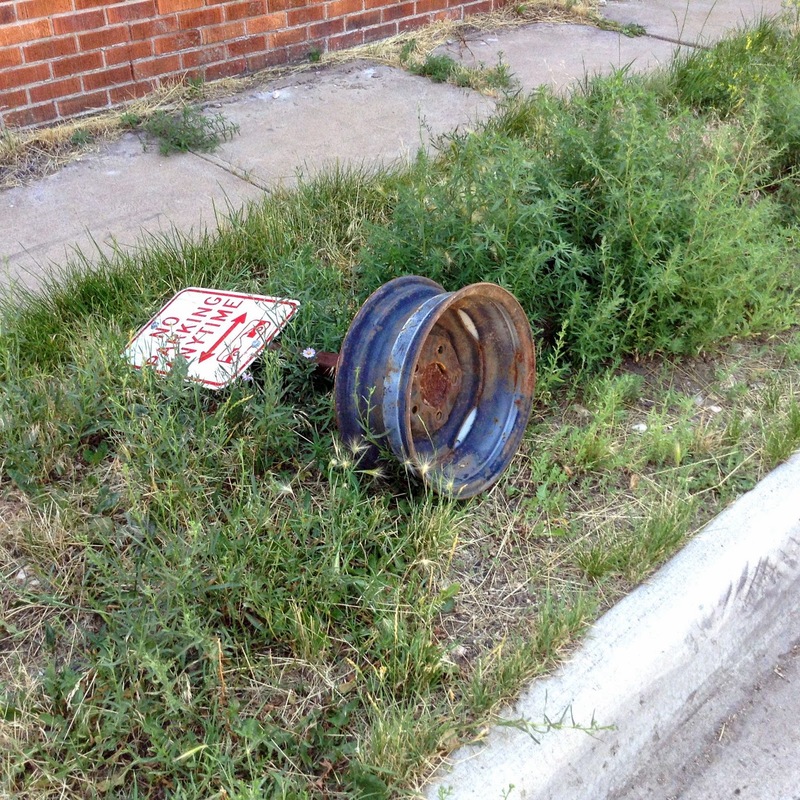 Parking artifacts often ended up in my photos -- not because I sought them out but because parking is such a big concern in our daily lives. 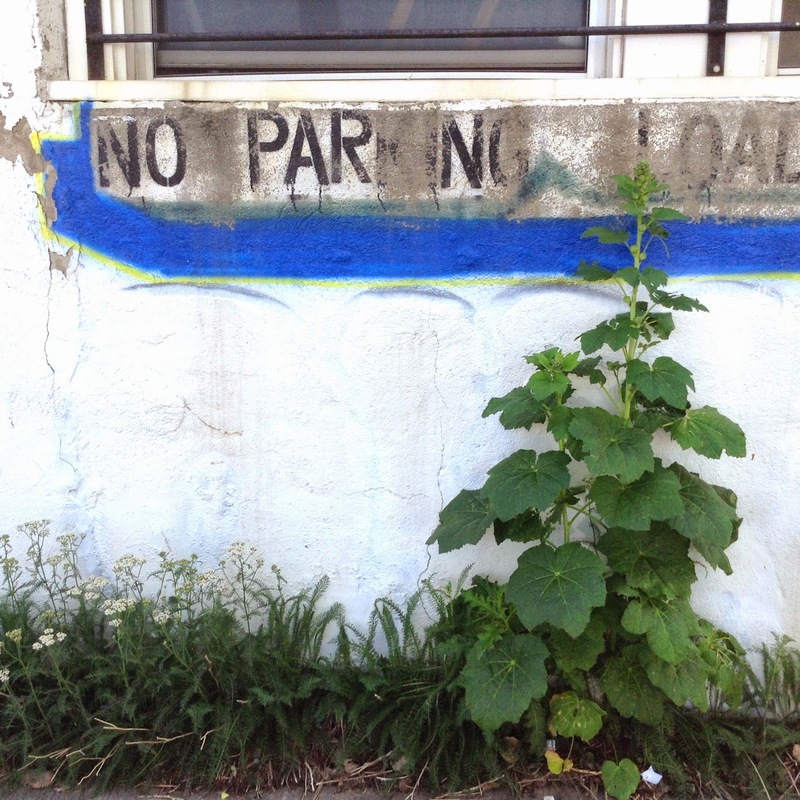 No Parking, with white yarrow and hollyhock. 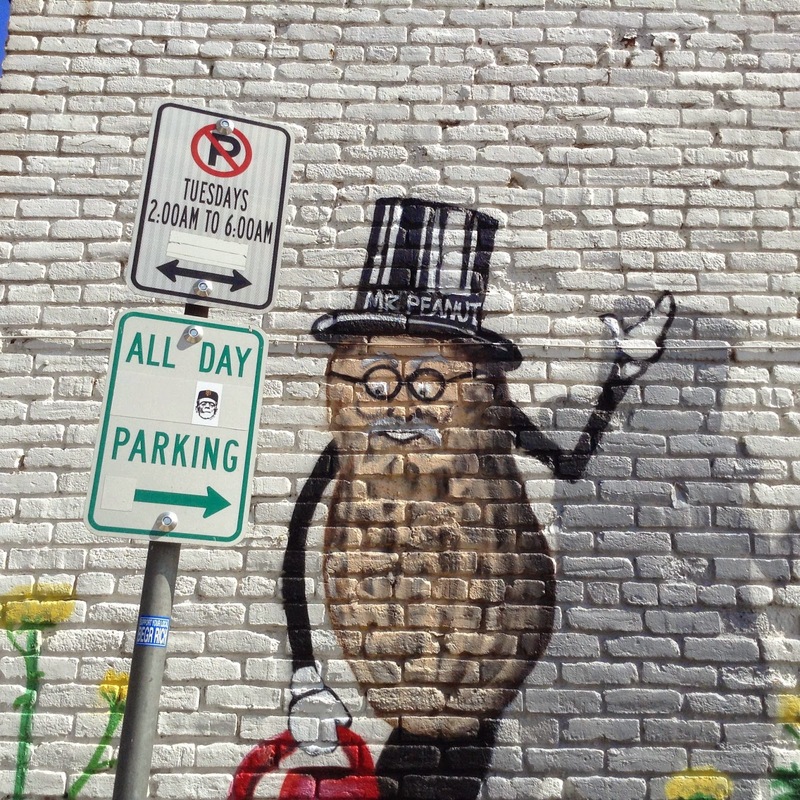 Much of Mr. Peanut's garden is in hollyhocks, both real and imaginary, with a healthy population of insects. 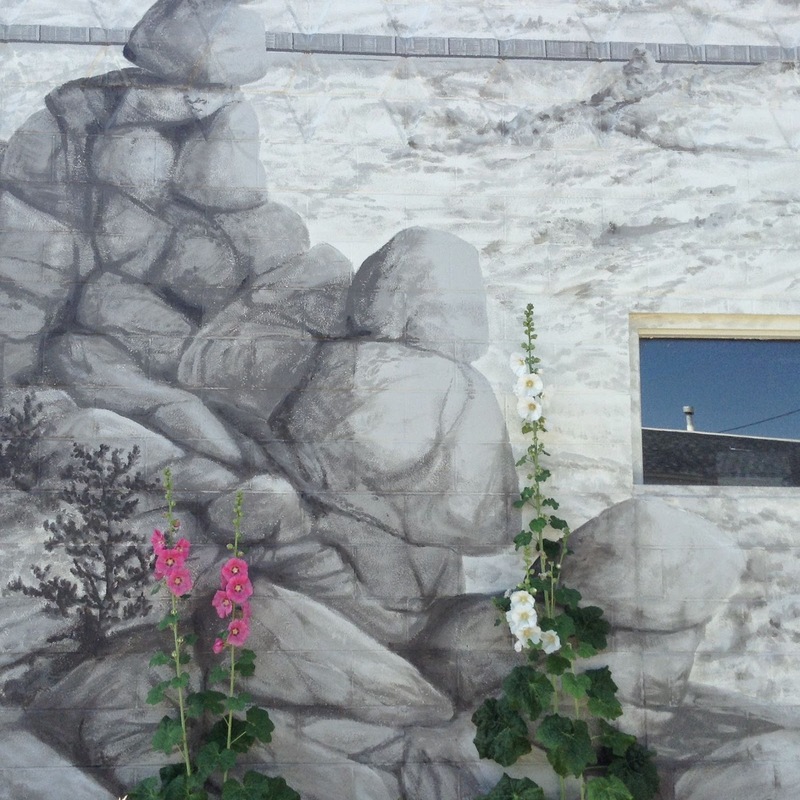 This is Hollyhock Haven by Travis Rhett Ivey. Foxtail, wild aster and yet more kochia, with fallen sign. 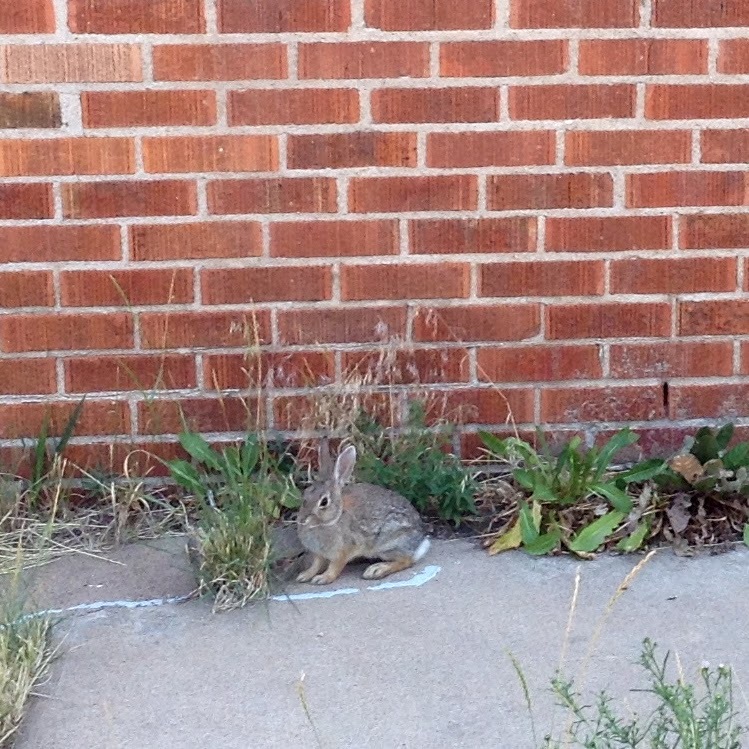 ... a cottontail popped out of the vegetation (see him below?). He stayed and watched me take photos. So I instagrammed him. 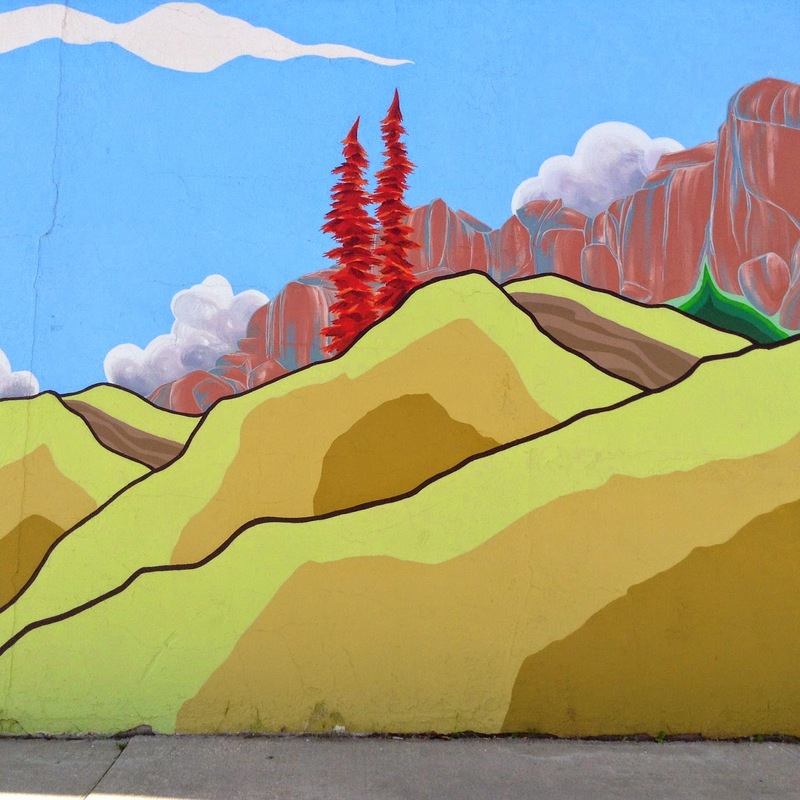 My favorite mural is Crossing Sherman Hill -- the famous grade across the mountains between Cheyenne and Laramie. 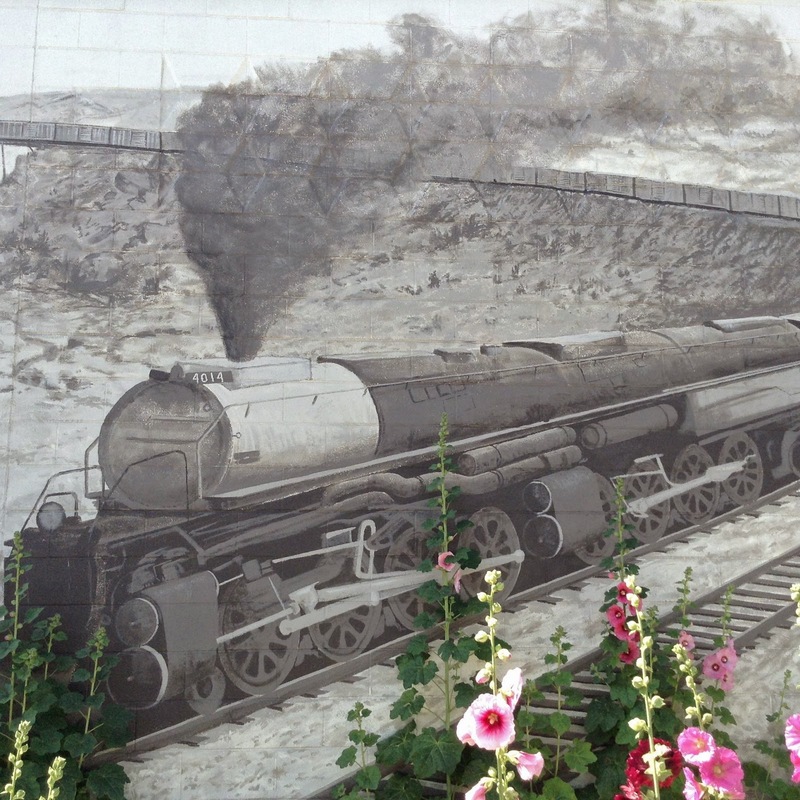 Here’s Union Pacific steam locomotive No. 4014 -- the Big Boy -- coming down the curving grade into the Laramie Basin. Up at the summit, the train passes by striking granite rock outcrops -- like Vedauwoo and the Crow Creek tors. 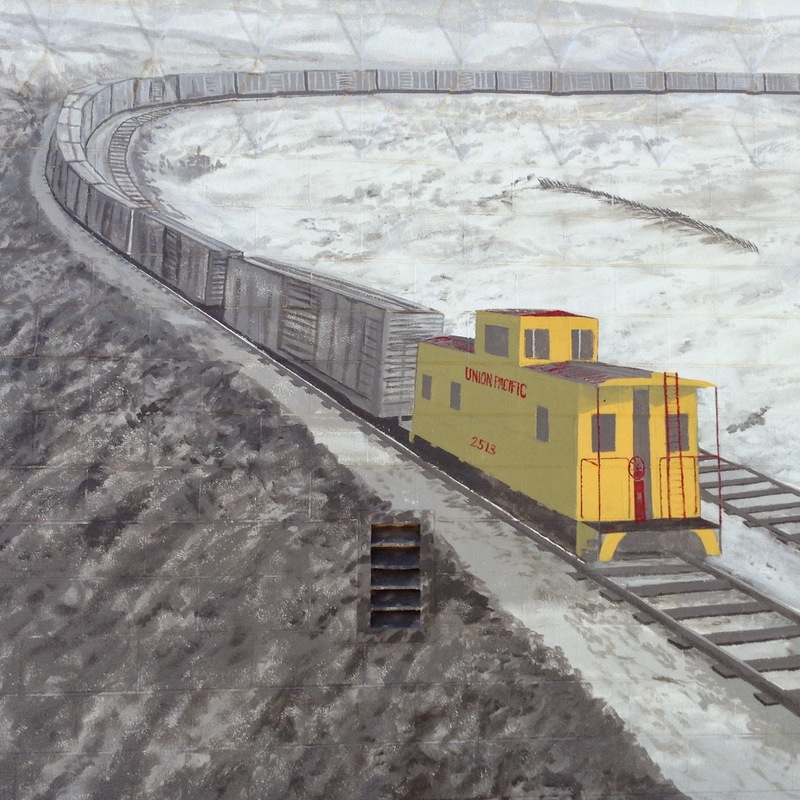 And finally -- the caboose, passing several of the many snow fences along the route. While I was sitting on the sidewalk photographing Virginia creeper in a crevice at the base of the Sherman Hill, two people approached me. But they didn’t look worried, or even puzzled. In fact, they were taking photos too. They had come from El Paso, Texas to Wyoming, for the Frontier Days celebration in Cheyenne, and drove over the Sherman Hill to visit Laramie and see the downtown murals. 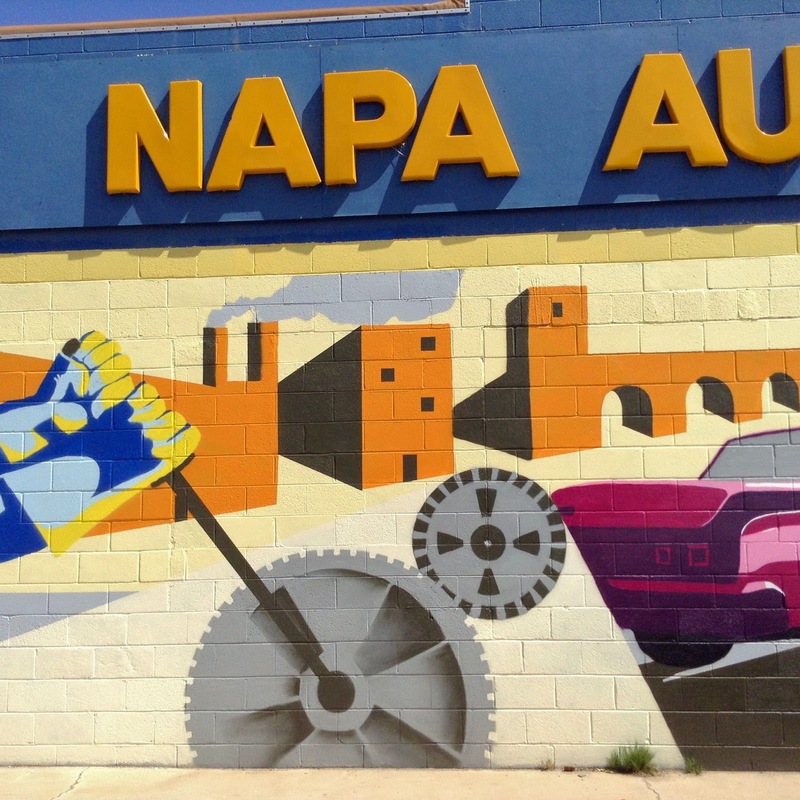 We chatted for awhile, then they headed off to the newest one, at the Napa auto parts store. I followed shortly. I found a small patch of saltgrass. 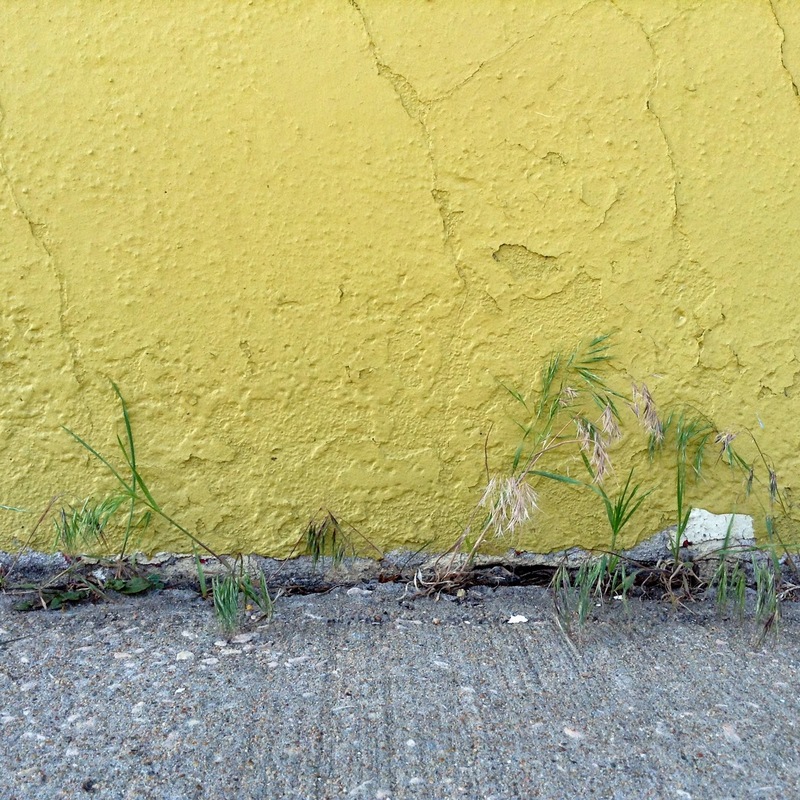 It’s one of our common prairie grasses, especially where soils are alkaline, but doesn’t seem to be much of a street plant. Saltgrass habitat, from We Built the Dream by Talal Cockar. 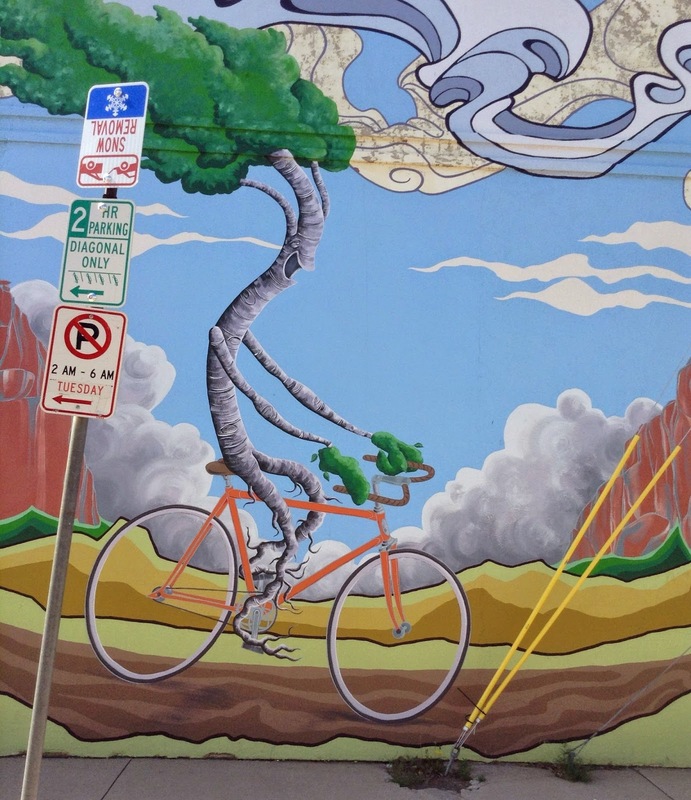 The Laramie Mural Project is a collaboration involving the University of Wyoming Art Museum, local artists and downtown business owners. A brochure is available at the downtown Tourism Office. 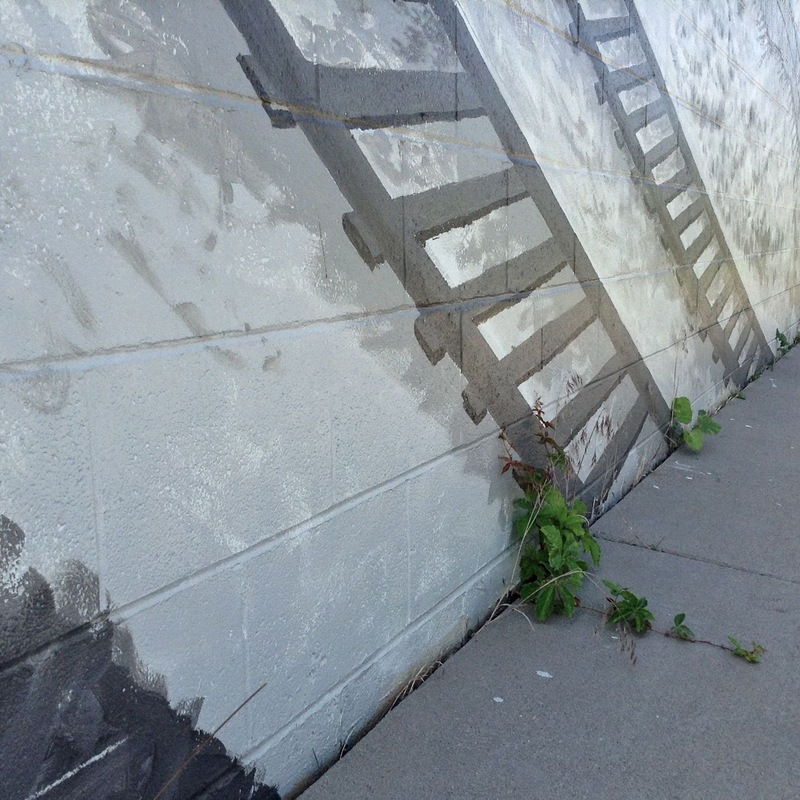 On the Project website, you can take an “audio tour” narrated by the artists (click on “Mural Tour”). The Great Unconformity is greater here. The juniper-covered hillside above doesn’t look terribly spectacular, but don't be fooled! A really long and puzzling story is told by these rocks -- the ones that are present, and especially the ones that aren’t. Portion of stratigraphic column from Knittel et al. (2004), modified. This diagram is a stratigraphic column corresponding to the hillside -- a schematic representation of the rock layers with the oldest at the base. Note the box with nothing but question marks. This is an unconformity, a hiatus, a missing interval, a gap in the rock record. And it's huge. The rock record is often referred to as a book, because rocks tell the story of the Earth if we know how to read them. Following this analogy, an unconformity means pages are missing ... or in this case, whole chapters. But were the pages really removed? Perhaps they were never written. Unconformity (Geol. ): a buried erosional or non-depositional surface separating two rock masses or strata of different ages, indicating that sediment deposition was not continuous. Unconformities aren’t rare. For example there are 14 major unconformities in the Grand Canyon of the Colorado River (USA; source). One of these gets almost all the attention -- the Great Unconformity, where the Cambrian Tapeats sandstone overlies the Precambrian Vishnu schist, a gap in the rock record spanning more than a billion years. View into the Grand Canyon from the South Rim. From the Colorado River (below left of center), the gray Vishnu schist rises steeply to cliffs of brown Tapeats sandstone. The contact between the two is the Great Unconformity. Photo courtesy Jack Share of Written in Stone. 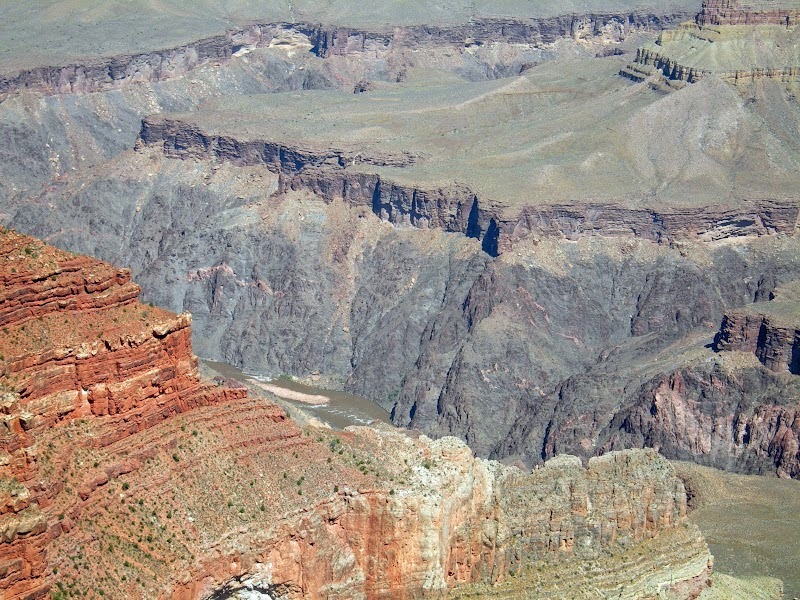 The Great Unconformity isn’t unique to the Grand Canyon. It’s exposed at scattered locations across North America and around the world. Why is so much of the rock record missing over such a large area? What does this say about that time on Earth? This is where the book analogy breaks down. While there is a missing part to the story -- a really long one, maybe equivalent to several chapters -- the gap isn't silent. Its existence tells something of what was going on at that time. The Great Unconformity began back when there was probably just one continent, Rodinia. [If you’re unfamiliar with how continents shift, grow, join, split and jostle each other, see this introduction to plate tectonics by the US Geological Survey.] 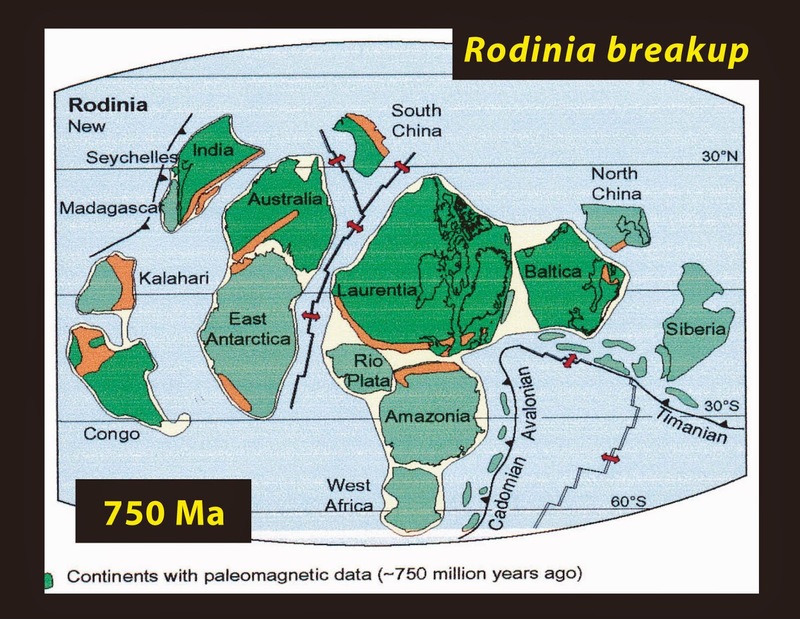 Supercontinent Rodinia stood above sea level for a long time, perhaps 350 million years. Not being underwater, deposition was minimal. Instead, erosion appears to have reduced Rodinia to a low relatively-flat surface of igneous and metamorphic rocks (not much protective vegetation in those days). These paleo-reconstructions of Rodinia are teaching slides from SnowballEarth.org. 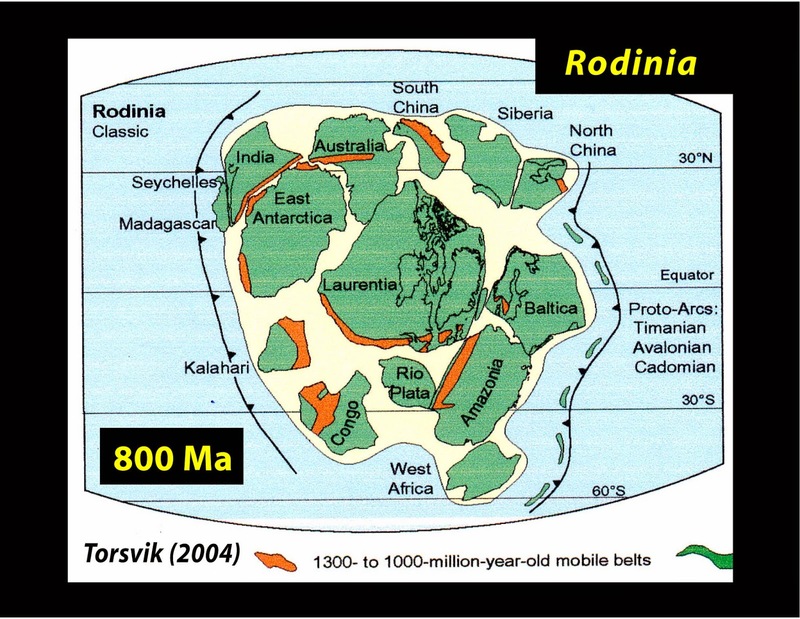 Then Rodinia began to come apart, as supercontinents do. Continent-sized and smaller pieces spread far and wide. 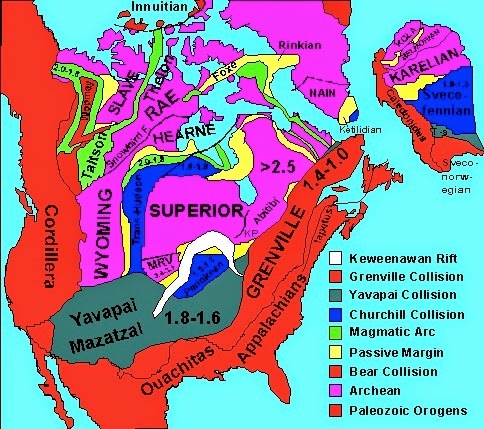 One of the biggest ones was Laurentia, or ancestral North America. As Rodinia broke up, much of Laurentia/North America was covered by shallow advancing seas, and sandy sediments were laid over the ancient rocks, now on the seafloor. With deposition underway once again, the gap in the rock record was brought to a close and the Great Unconformity ended. Geologist Wayne Ranney embraces more than one billion years of Earth history in the Grand Canyon. Ages are approximate. Photo courtesy Jack Share of Written in Stone (labels added). ... but the Great Unconformity in south central Wyoming is greater! That’s because the underlying older rocks are older, and the overlying younger rocks are younger. The Greater Great Unconformity near Fremont Canyon, Wyoming. Ages are approximate. Why are the older rocks older? Because Laurentia/North America was not uniform in age -- it was an assemblage of older continents and other crustal pieces. The Wyoming Craton was one of the oldest, with rock ages ranging from 1.7 to 3.6 billion years. 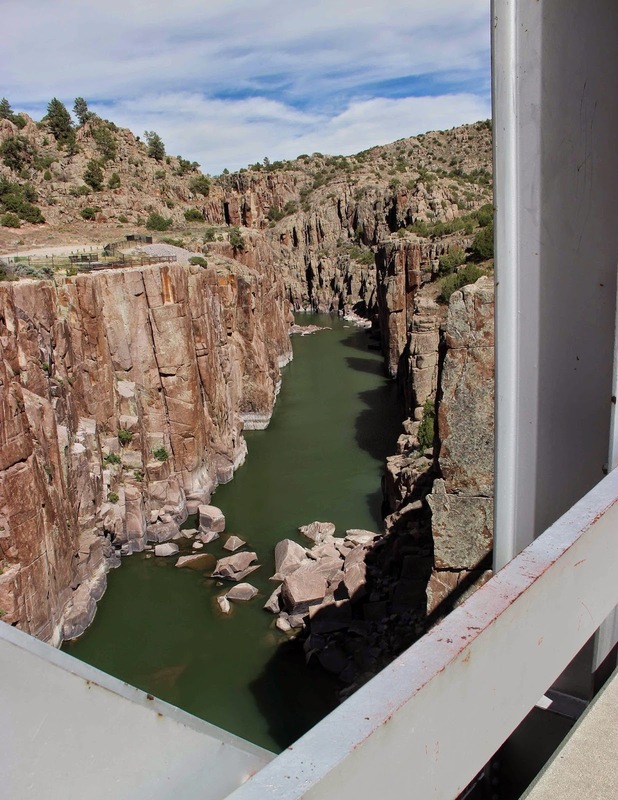 The granite at Fremont Canyon is roughly 2.4 billion years old. 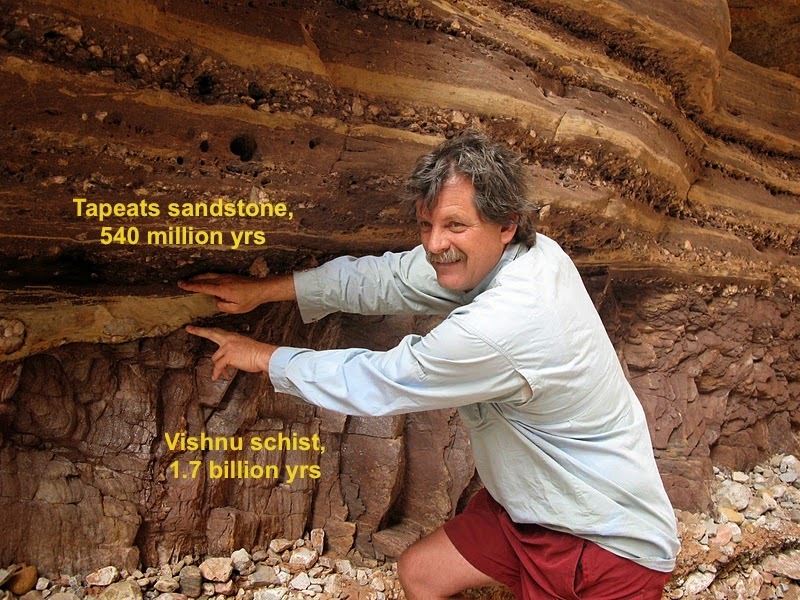 In contrast, the Vishnu schist in the Grand Canyon is “only” about 1.7 billion years old. Modern-day Wyoming is in one of the oldest parts of North America; source. 2.4-billion-year-old granite in Fremont Canyon, cut by the North Platte River. And why are the younger rocks younger? That story’s a little more complicated. After Rodinia broke up during the Cambrian period (roughly 500 million years ago), much of Laurentia was covered by a great shallow sea -- the Sauk Sea. Lots of sand was deposited, so the Great Unconformity usually consists of Cambrian sandstone atop Precambrian igneous or metamorphic rocks, as in the Grand Canyon. But this isn’t always the case. Not all that long ago, the overlying sandstone of the Great Unconformity in south central Wyoming was assumed to be a typical Cambrian sandstone. Then Sando and Sandberg (1987) went and looked at it. Not Cambrian, they concluded. Instead, they recognized a new formation, the Fremont Canyon sandstone, which was younger by a hundred million years or so (late Devonian). Thus the Great Unconformity in south central Wyoming grew to two billion years. But their discovery created still more questions. 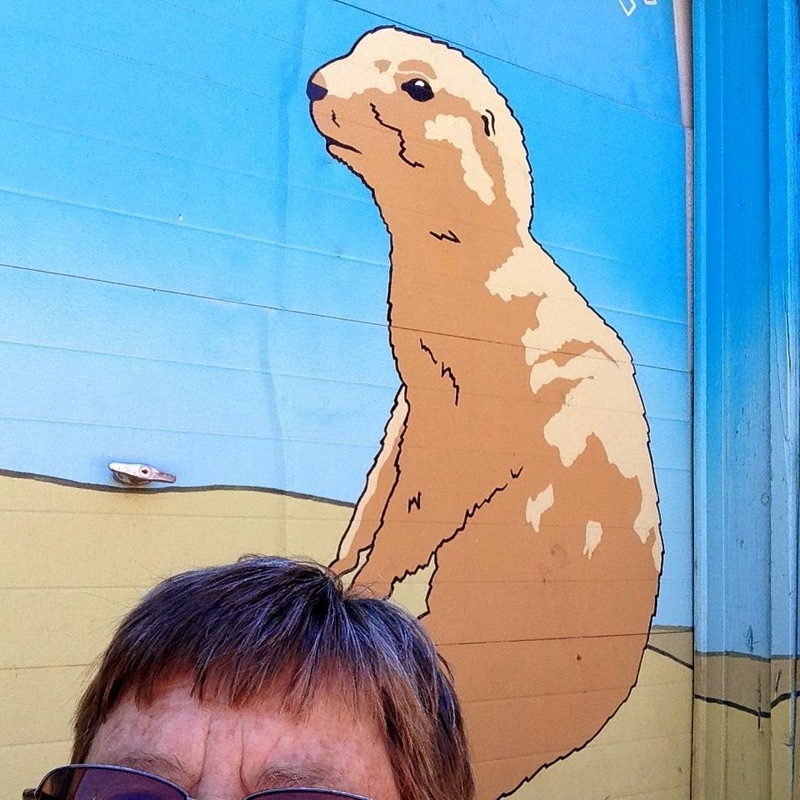 Where are the Cambrian sands of the great Sauk Sea? Why are they absent? Were they removed by erosion? Perhaps they were never deposited. Indeed, parts of Laurentia remained above sea level during the Cambrian period -- the Canadian Shield and possibly a Transcontinental Arch. Paleo-reconstruction of Laurentia during late Cambrian time, with highlands labeled. Modified from the EarthViewer App, free from the Howard Hughes Medical Institute. So the story told by the Great Unconformity remains incomplete. At minimum we're missing much of the chapter on south central Wyoming, and probably more. But scattered pages will continue to be found, and though they may be really hard to read, we'll learn a bit more about Earth's deep past. How amazing and wonderful, especially for geo-trippers! The Greater Great Unconformity is exposed southwest of Casper, Wyoming, thanks to uplift during the Laramide Orogeny and erosion by the North Platte River. 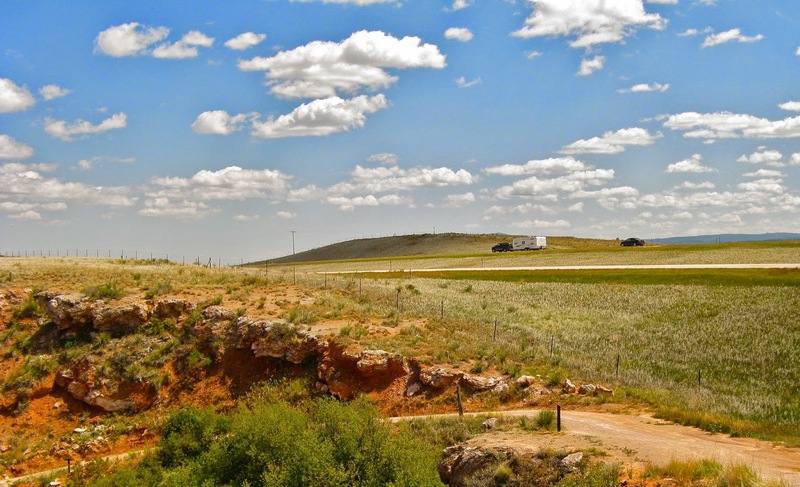 It can be conveniently viewed northwest of Natrona County Road 408 about a half mile east of the Fremont Canyon Bridge. Other viewpoints are described in Knittel et al. (2004), pp 26-27 and 64-69. 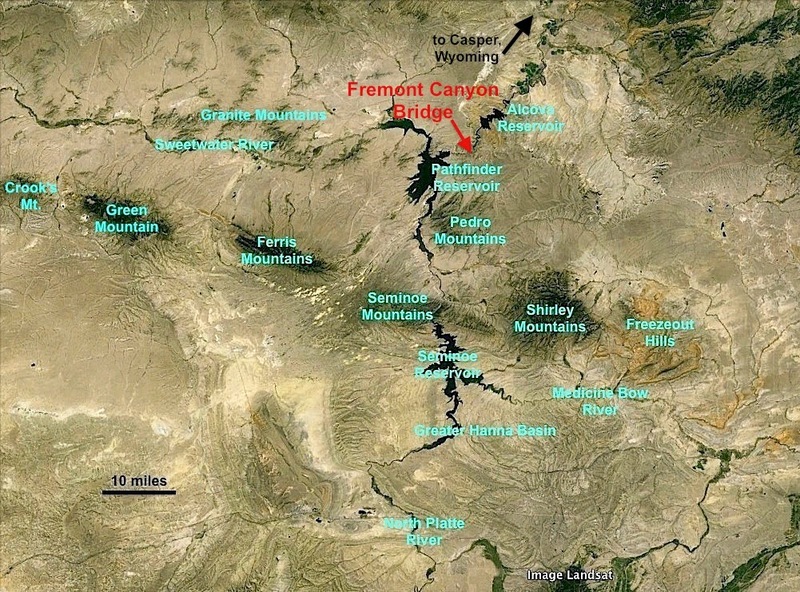 Fremont Canyon is in the Heartland of Laramide Tectonics. Click on image for a better view. Jack Share's blog Written in Stone, Seen through my Lens includes very informative posts about the Great Unconformity, available here. Myrow, PM, Taylor, JF, Miller, JF, Ethington, RL, Ripperdan, RL, and Allen, J. 2003. Fallen arches: Dispelling myths concerning Cambrian and Ordovician paleogeography of the Rocky Mountain region. Geological Society of America Bulletin 115:695-713. Sando, WJ and Sandberg, CA. 1987. 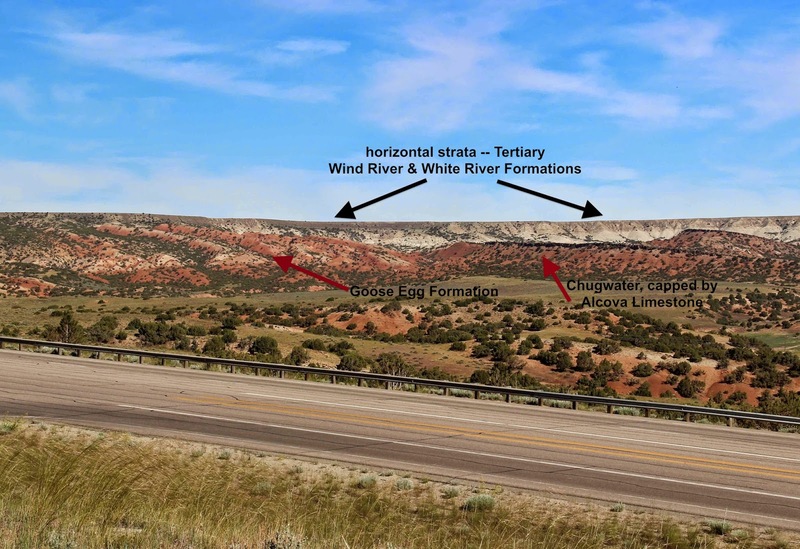 New interpretations of Paleozoic stratigraphy and history in the northern Laramie Range and vicinity, Southeast Wyoming. US Geological Survey Professional Paper 1450, 39pp.